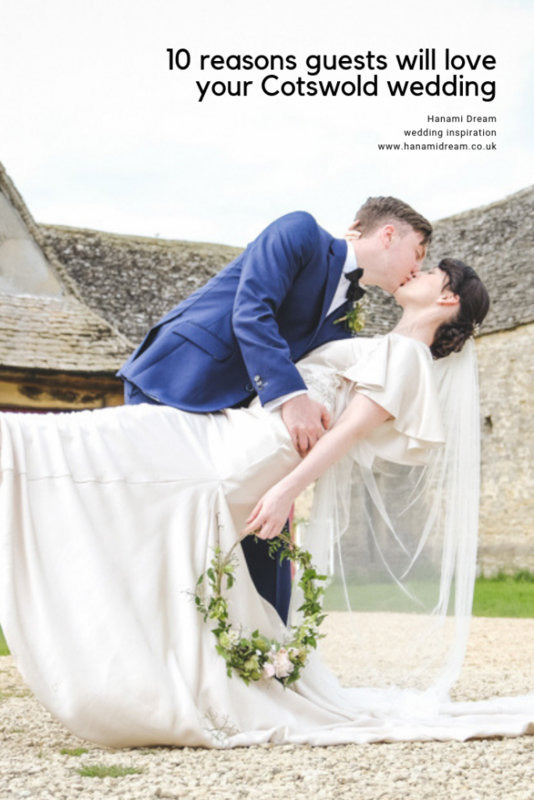 Hanami Dream is based in West Oxfordshire and there are some truly beautiful wedding venues to choose from in the surrounding Cotswolds. 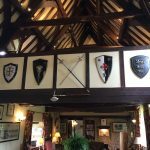 Whether in a barn, a manor house, a marquee or a hotel, there are some amazing places to hold your wedding or special occasion. 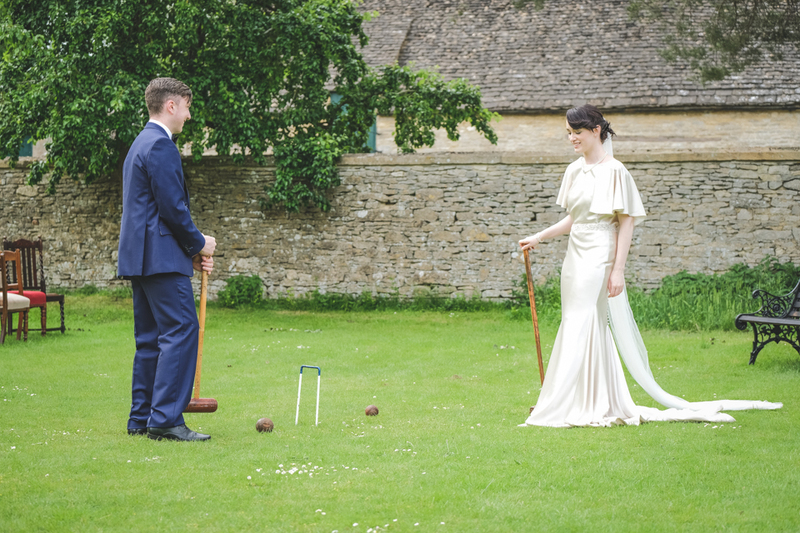 Take a look at the venues with wedding licences where you can get married in West Oxfordshire. The Cotswolds is a relaxing escape from the big cities, with rolling hills, acres of lavender fields, historical towns, stately homes and picturesque, chocolate box villages with their honey coloured limestone buildings. 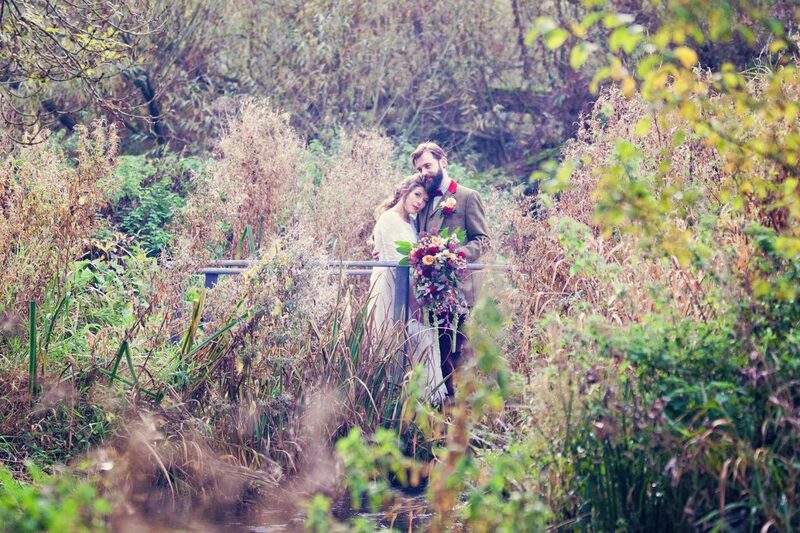 So it is no wonder many couples choose to say ‘I do’ in this area of outstanding natural beauty. 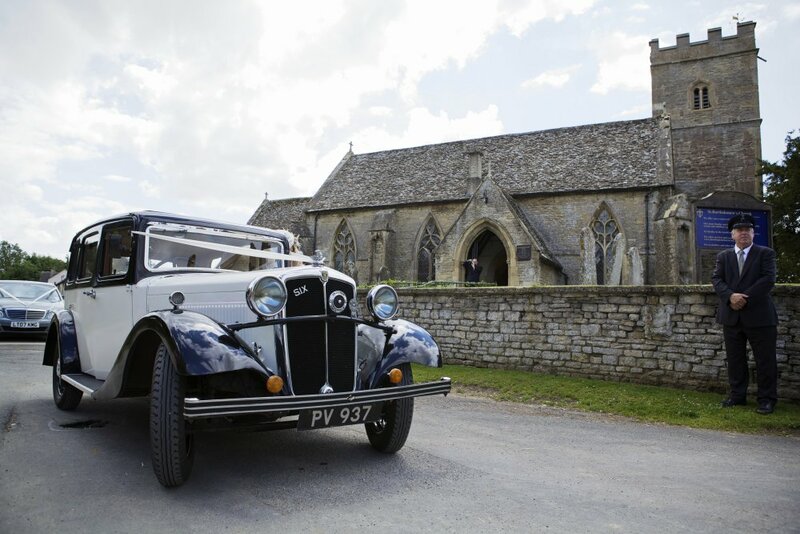 Your guests may have travelled far and wide for your big day so may wish to stay overnight (or longer). 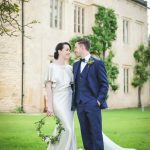 After the wedding, here are some places that your guests may wish to visit in and around Witney to make a proper get away of their trip (and five of them you can get married at too!) As featured on travel blog Twenty Six O Two. Witney is famous for 3 Bs: blankets, bread and beer. The major one of these is it’s woollen mills and blanket industry. Blankets were first made here in AD969 and there was a working blanket factory until 2002. There are old woollen mills around the town (although most are converted to offices or flats now). A walking tour of the town takes in most of the relevant locations such as the Market Place, The Blanket Hall, Weavers Cottages, The Buttercross, Corn Exchange (where you can have a civil wedding ceremony) and the River Windrush (which would have provided clean water for cloth making and was a good stream to power the mills). Witney and District Museum is worth a visit for history buffs and there are awesome monthly pie nights held at The Blanket Hall. Witney also has a history of brewing since 1841 and the Wychwood Brewery is sited here brewing the legendary Hobgoblin beer and offers guided tours and tastings. 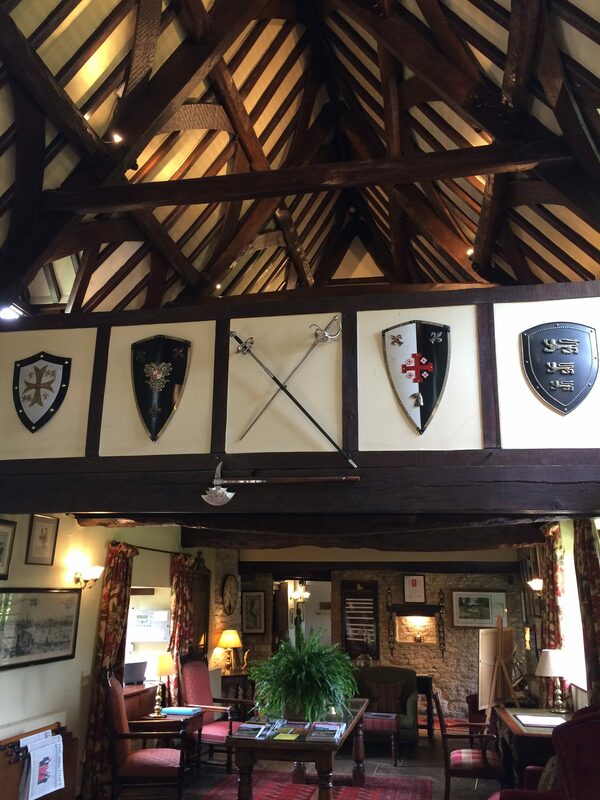 Cogges Manor Farm is a local museum and farm attraction which puts on lots of events throughout the year. It is a haven and wonderful place to escape with the children. More than just a farm museum, it was a set location for a lot of the interior shots of Downtown Abbey, as well as featuring as the childhood home of Sidonie-Gabrielle Colette in the film Colette, released in 2019 and starring Keira Knightley and Dominic West. 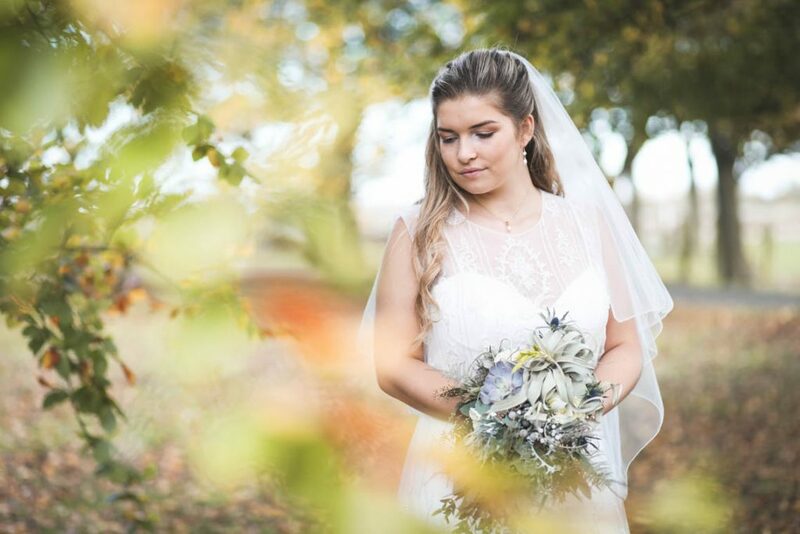 With beautiful grounds, animals and a manor house, it also has two stunning seventeenth century barns which provide a wonderful setting for weddings and celebrations. Witney boasts a great number of unique and independent retailers (like Rapture and the Old Pill Factory) as well as some major big hitters (such as M&S, Debenhams, Next, Fat Face and White Stuff). With two main shopping areas at either end of the High Street, people flock to shop in Witney. Even more so as the parking is free throughout the town. At the bottom of the High Street, is Church Green which is great to sit and take a rest from shopping. Or just the other side of St Mary’s Church is The Leys, a spacious recreational ground. The Leys makes a great day out with the kids, complete with amazing park equipment, a splash park, crazy golf and toilets. You can take a picnic or eat at The Coffee Shed. During the summer months it is used as the perfect place to host Witney carnival and numerous music concerts. Witney Lake (known locally as Duck or Ducklington Lake) is a picturesque spot for a leisurely walk just a short way from the town centre. Good for relaxing walks, bird watching, fishing or feeding the ducks, it is exactly a mile to go around the lake. If you fancy a slightly longer walk you can go across fields towards the neighbouring village of Ducklington, home of the elusive Fritillary flower. 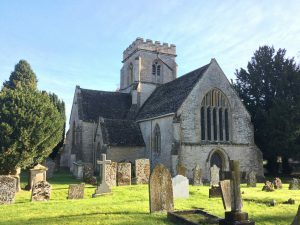 Not far out of Witney is Minster Lovell, an idyllic and remote Oxfordshire village. You can walk to the Minster ruins from Witney if you’re feeling spritely. 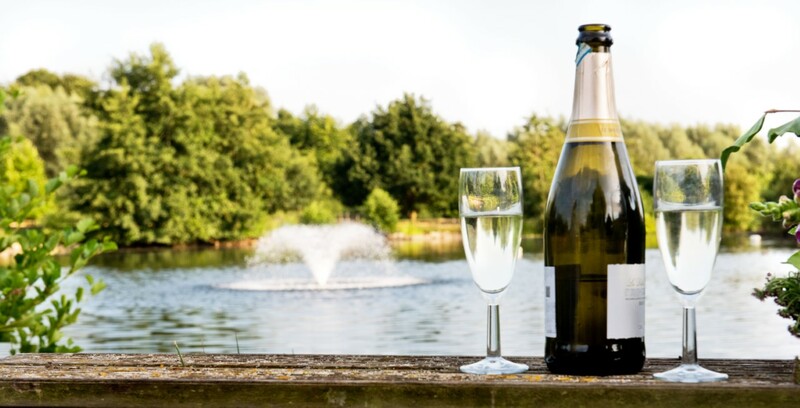 Where you could reward yourself with a refreshing drink at the Old Swan and Minster Mill, or better still enjoy their spa facilities to completely unwind. 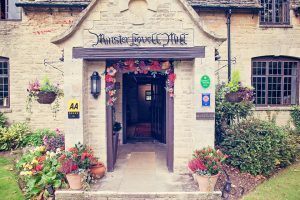 A 5-star country inn set on the River Windrush surrounded by 65 acres of Cotswold wildflower meadows and riverside gardens. This is a destination to get away from the hectic, crowded city to a stunning and tranquil setting. A short drive towards Brize Norton, will bring you to the UK’s only crocodile zoo, Crocodiles of the World. There are over 150 crocodiles there from 15 different species including crocodiles, alligators and caimans, as well as other reptiles. Feeding time is always exciting to watch and the knowledgeable staff give really in depth and interesting talks at different times of the day, plus you might even get the chance to hold a baby croc. 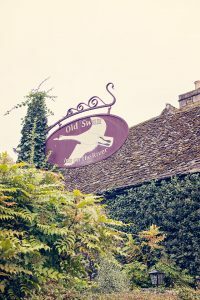 There are so many reasons to visit the nearby town of Burford including the immense garden centre, its medieval bridge, old stone houses and attractive frontage. Burford is quite rightly called one of the most picturesque towns in England and just simply walking around the town can happily wile away an afternoon. In addition, Cotswold Wildlife Park (just outside of Burford) is well worth a visit with so many amazing animals to see including lions, giraffes (where you can go on to a platform to be face to face with them), rhinos (and even a baby rhino), zebras, penguins, birds, reptiles, primates, as well as a farmyard, train and adventure playground. The opposite way out of Witney, set in rural Oxfordshire lies Eynsham Hall which, despite its name, is actually in North Leigh (on the road between Witney and Woodstock) rather than in Eynsham itself. After driving through wooded areas, you come upon some impressive gates that lead the way to the estate. The half-a-mile, tree-lined, driveway escorts you until the Hall slowly comes in to view. 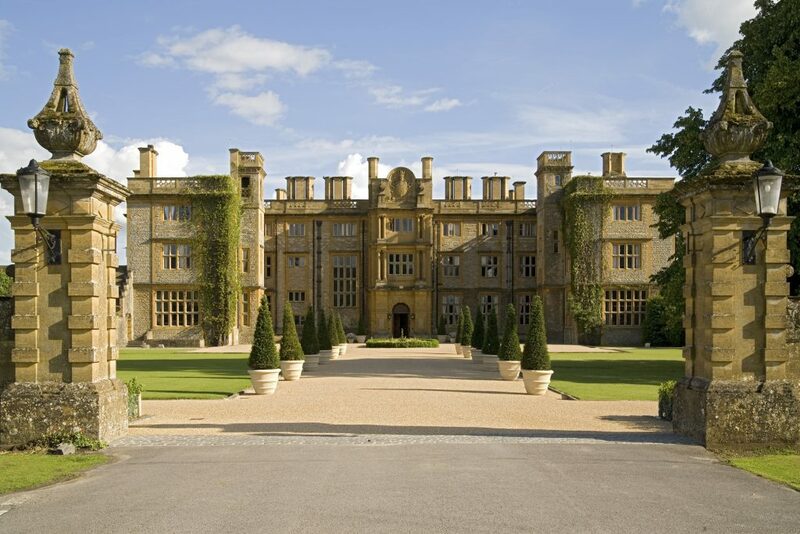 You can certainly spoil yourself at this country house hotel and enjoy a lavish afternoon tea at Eynsham Hall. You can’t come to this neck of the woods without a visit to Blenheim Palace in Woodstock. Birthplace of Winston Churchill, steeped in history with absolutely phenomenal grounds, palace tours, butterfly house, maze, miniature train and adventure playground. Not to mention all the events and shows that are put on throughout the year, as well as being able to get married in style here. 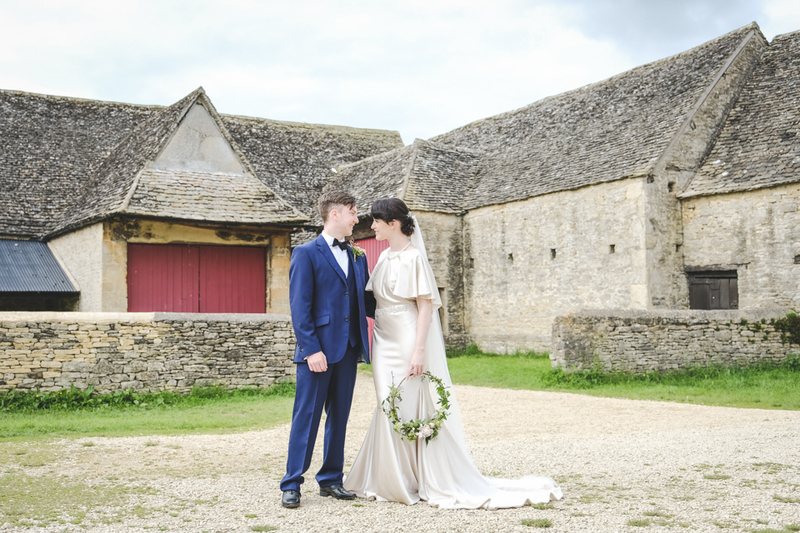 Merriscourt is one of my favourite barn wedding venues in the heart of the Cotswolds. A vast expanse of space and possibilities; complete with modern facilities, accommodation and in house catering options. It is a ‘one stop shop’ of a wedding venue which offers freedom, creativity, transparent pricing, and above all lots of space. There’s a real sense of calm and peacefulness about the surroundings and it feels very homely. You have full reign of the whole place during the event and can also stay over in one of it’s many accommodation options. 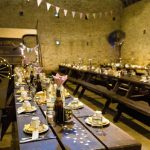 The venue is actually 3 interlinking converted barns around a beautiful central courtyard with a picturesque tree, giving a wonderful focal point from each of the surrounding barns. 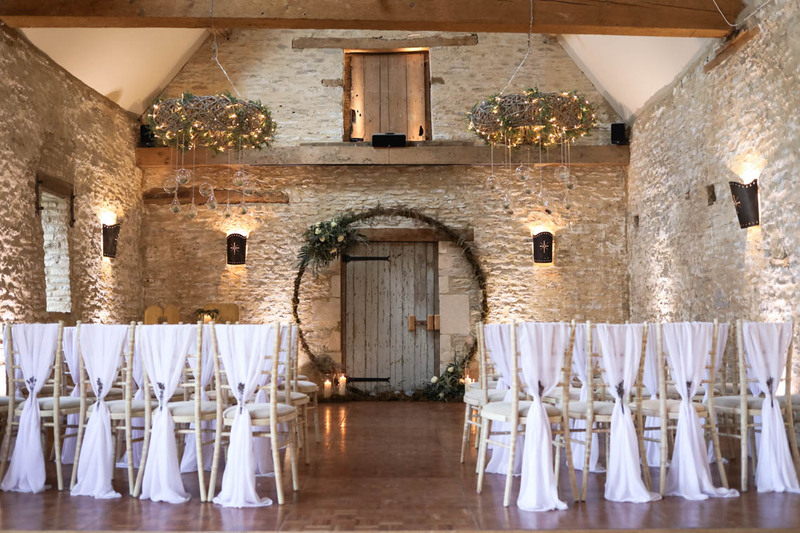 This wedding venue is blessed with high beamed ceilings, Cotswold stone walls adorned with subtle tapestries, and oodles of light. Much more than just a blank canvas, this converted barn looks like a home from home. It’s your own house party for the weekend. 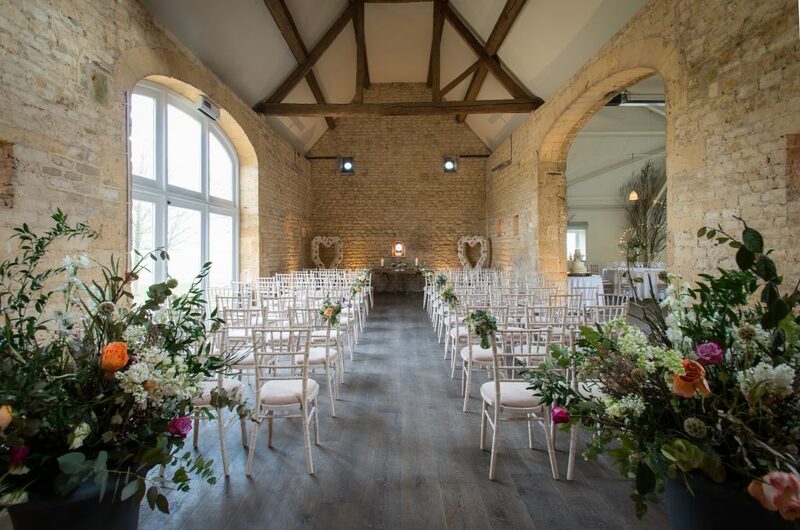 With space for a ceremony, drinks reception, sit down meal and dance floor without having to turn each space around; it rightly boasts lots of space. 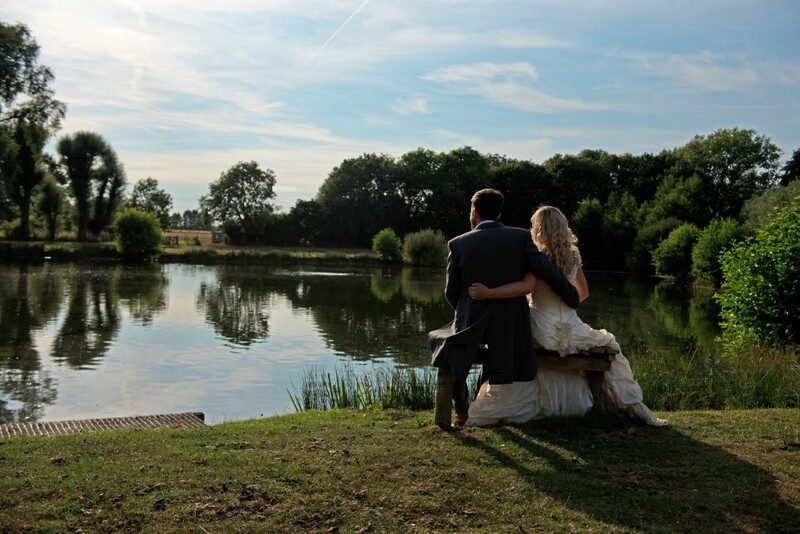 Plus there’s no need to relocate for any element of your special day with accommodation on site too. I don’t think I’ve ever heard a bad comment about Merriscourt. Couples have all said how great it is and that everything is clear so there’s no second guessing when wedding planning. It would seem that Merriscourt can’t do enough for couples and go out of their way to ensure the day couples desire. 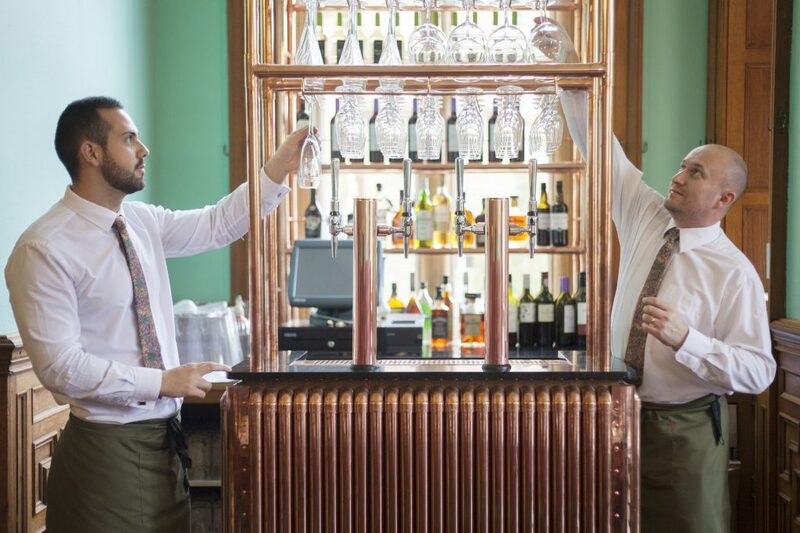 Plus from a wedding guest point of view, the staff seamlessly usher you through each aspect of the day from room to room. This wedding venue is a real home from home that can be adapted just how you want it with an abundance of space and options. 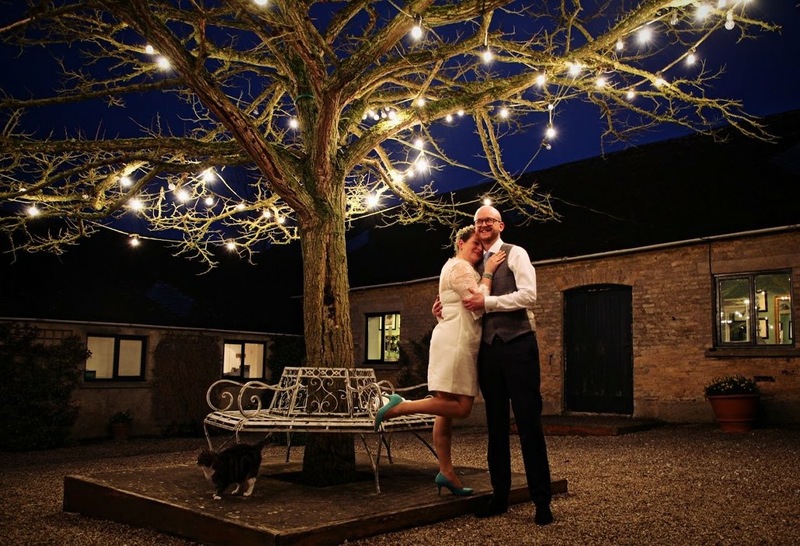 See an inspirational French foodie’s fête wedding at Merriscourt. 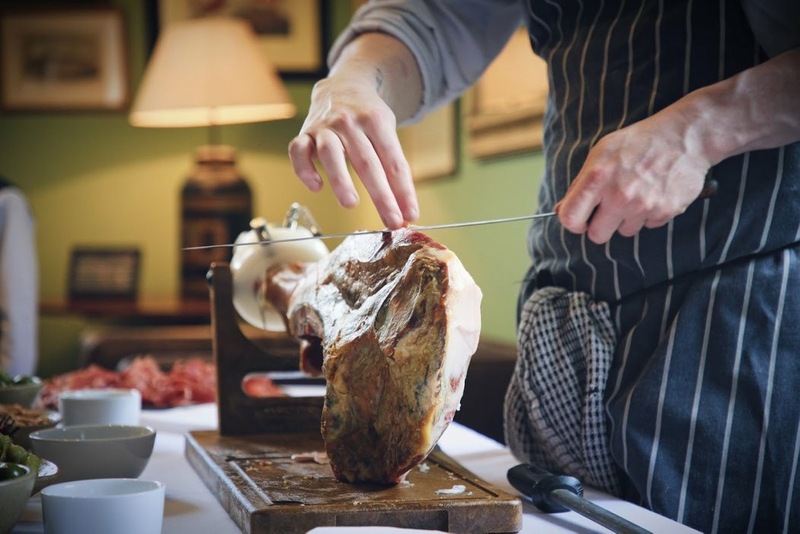 Wedding breakfast: packages for canapes, sharing boards and bbqs. Three course meals from £36pp. 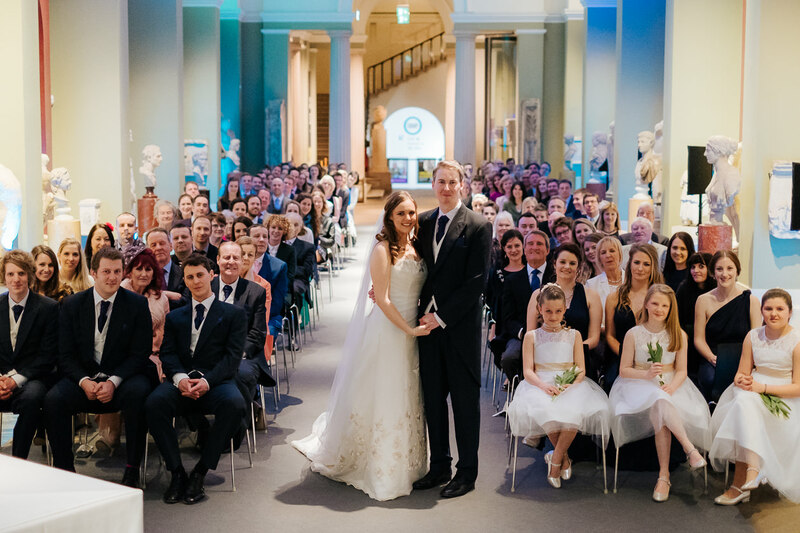 You’d be forgiven if you didn’t realise that you could get married at the magnificent Ashmolean Museum in Oxford – there are some wonderful unknown venue options on offer right on our doorsteps. 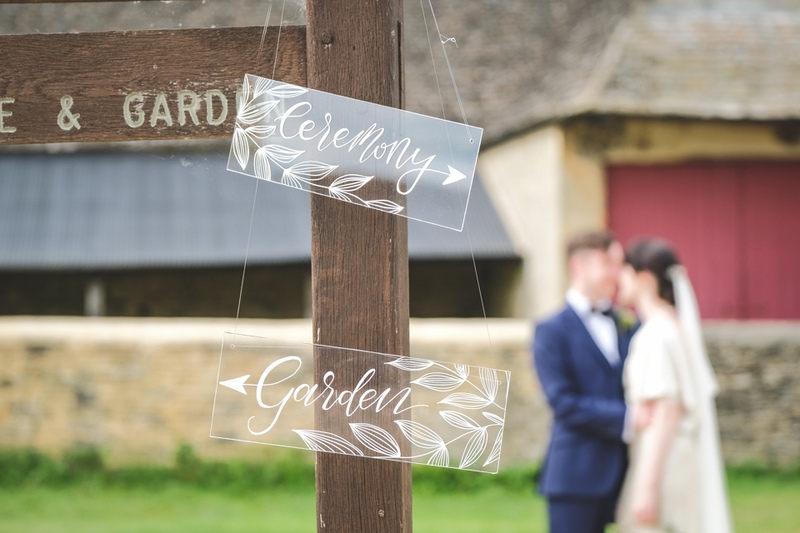 In 1995, the law was changed to allow marriages to be conducted in other civil approved venues in addition to a registry office or religious premises. 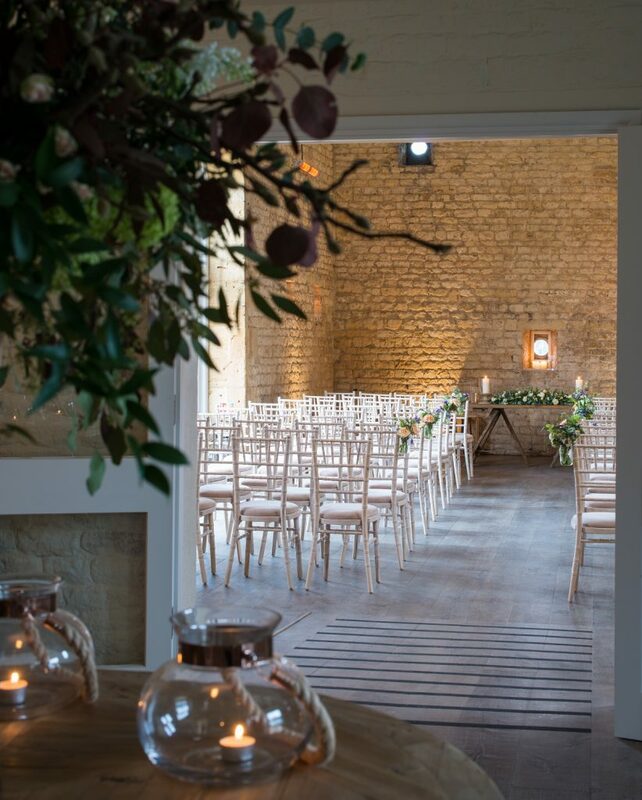 Now over 50% of ceremonies are carried out in these type of venues and there are some truly beautiful venues to choose from in Oxfordshire and the surrounding Cotswolds. 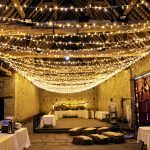 Whether in a barn, a manor house, a marquee, a museum, or a hotel, there are some amazing places to hold your wedding or special occasion. There’s something out there to accommodate most styles, guest numbers and budgets. The Ashmolean Museum is slap bang in the middle of a wonderful university city – steeped in history, with an abundance of amazing architecture, and nicknamed the ‘city of dreaming spires’. Just a few minutes walk from the city centre shops is this impressive building, conveniently opposite the prestigious MacDonald Randolph Hotel, where guests often choose to stay and then can just walk across the road. 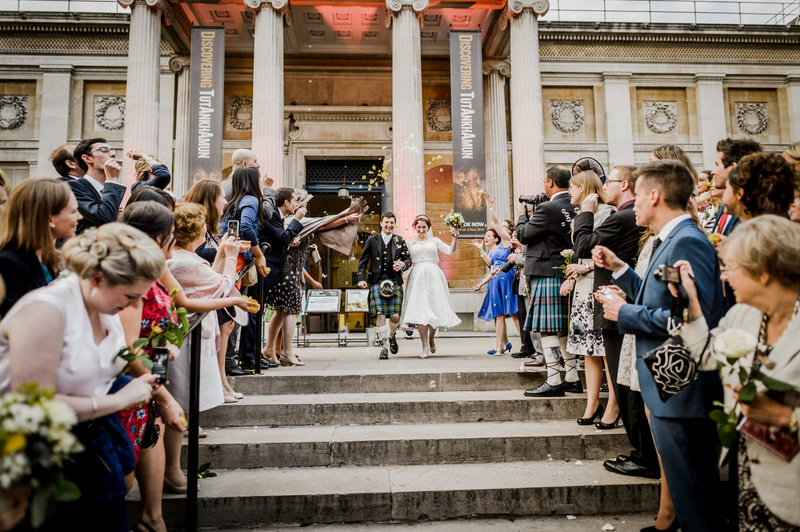 The Ashmolean Museum gives you maximum impact with minimal effort, as the backdrop of this venue needs no help in packing a punch – the wow factor is there for you already! 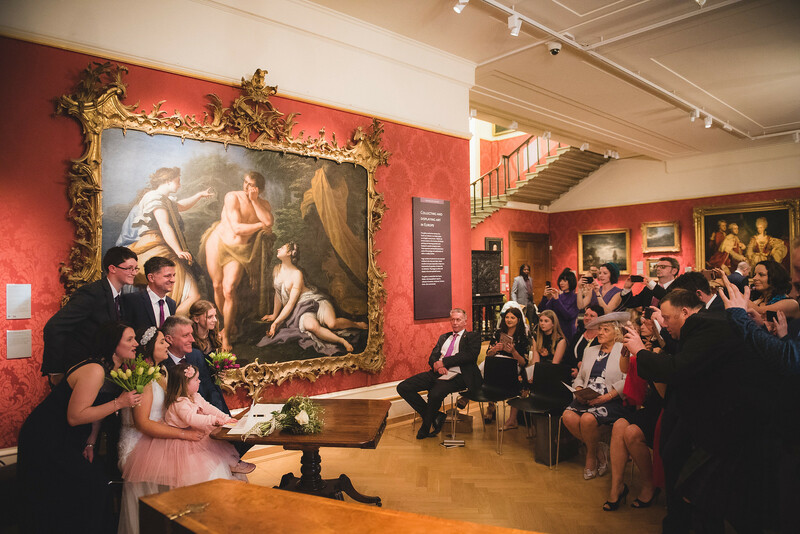 One of the most striking things about this venue is there are many options and different ways you could use a combination of the galleries for your drinks reception, licensed ceremony, dinner and dancing. Each gallery has it’s own character, atmosphere and capacity that can be suited to your number of guests and requirements. This is a venue which is quiet, personal and intimate, yet very much on the grand scale. Once the museum has closed to the public, you have full rein of the venue from 5.30pm. 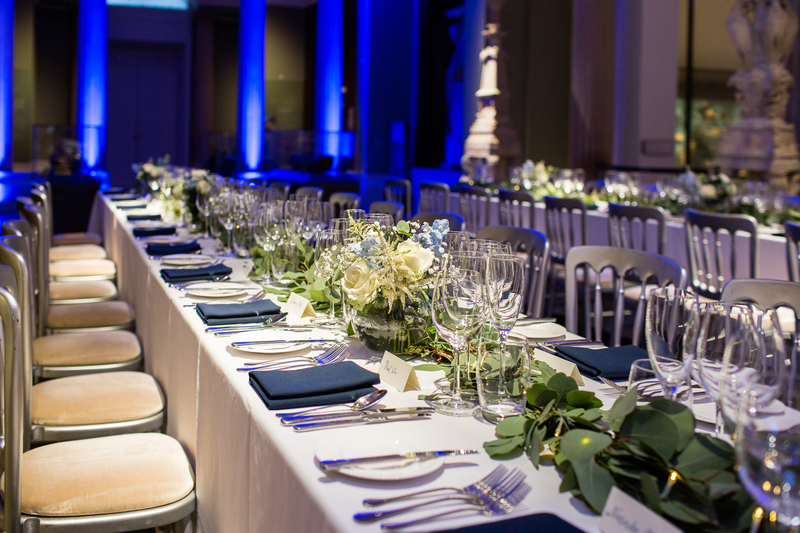 For example, you could choose to have a drinks reception on the Rooftop Restaurant Terrace where it has a more contemporary feel; your wedding ceremony in the European Art Gallery with imposing portraits, picture perfect harpsichord playing and a sweeping staircase to make a grand entrance; dinner in the Greek and Roman Sculpture Gallery; and then dancing in the Vaulted Café in the basement with booth style seating and nightclub feel. There’s certainly nothing staid or boring about this museum. And whilst I visited on a grey day at the end of May, there still was loads of light pouring into the venue. Brides come in through a side entrance secretly to avoid the guests who are coming in through the main entrance. 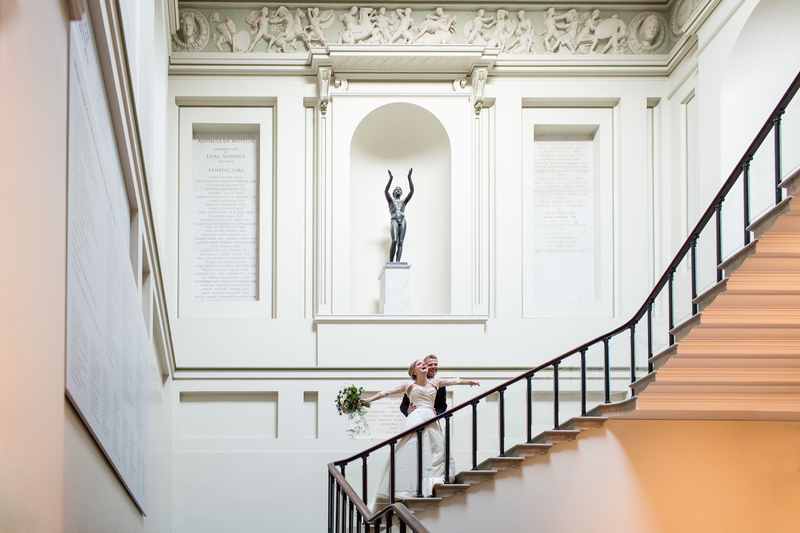 Then the bride is often brought down the grand staircase to make an entrance into the European Art Gallery. 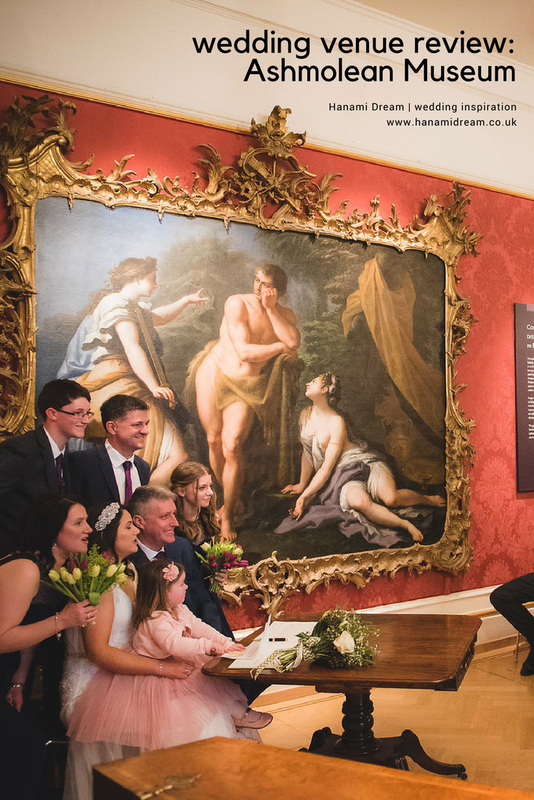 How awe-inspiring to spend your wedding day looking at some masterpieces and have statues looming over proceedings. 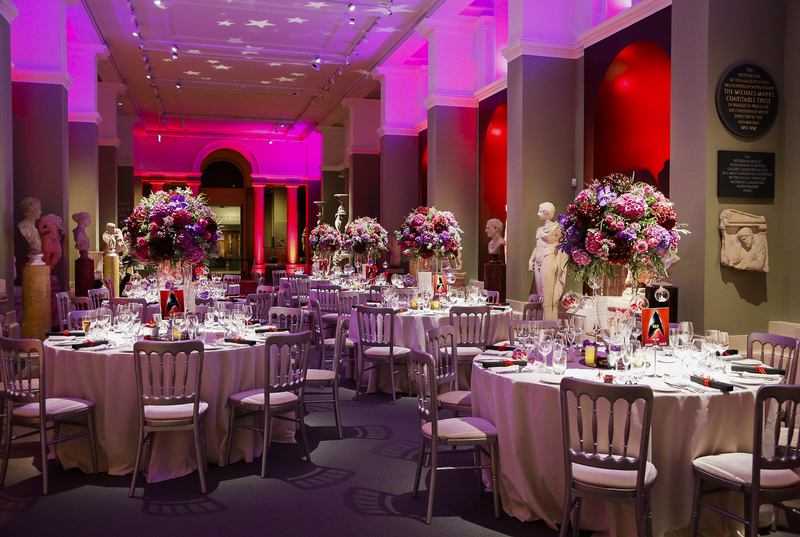 All you need to decorate most of the galleries would be some up lighters for alcoves or where statues stand and spot lights for the aisle. 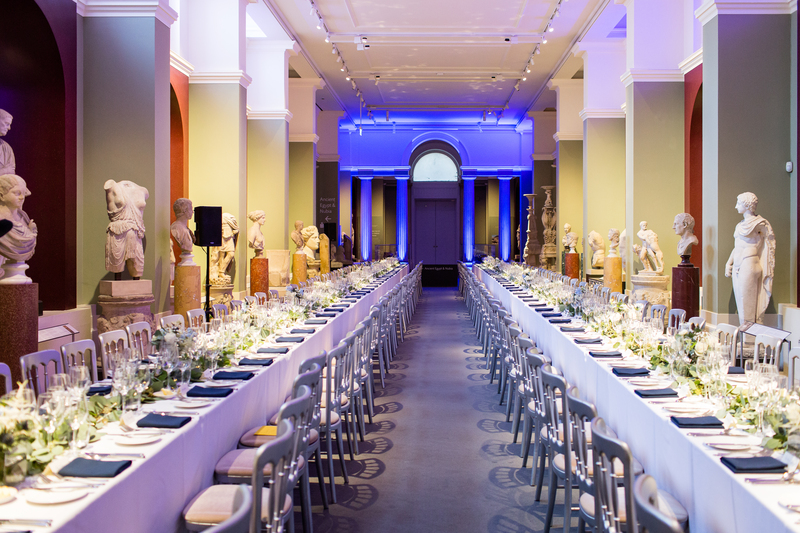 The Museum use Clerkwenwell Green as an exclusive catering partner to complete the wedding experience at the Ashmolean. 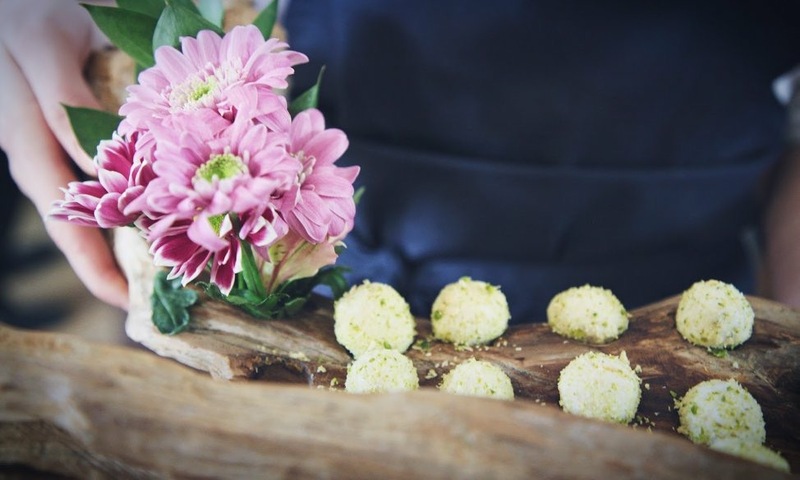 Being a bespoke Events Catering Company based in Hoxton London, they too take the guests on a journey, delivering cool, confident and considered food that has been created with passion and designed carefully to showcase the best seasonal ingredients available throughout the year. Head Chef Mike Dewing was recently awarded ‘Chef Of The Year’ in 2017 by Benugo. Chairs and tables are included in the price and they also offer a range of table linen, china and glassware. There doesn’t seem to be anything that is too much to ask of this venue. They seem extremely flexible to accommodate couples’ wishes for their big day. With the understandable exception of red wine (apart from in the dinner and dancing areas), anything seems to go! 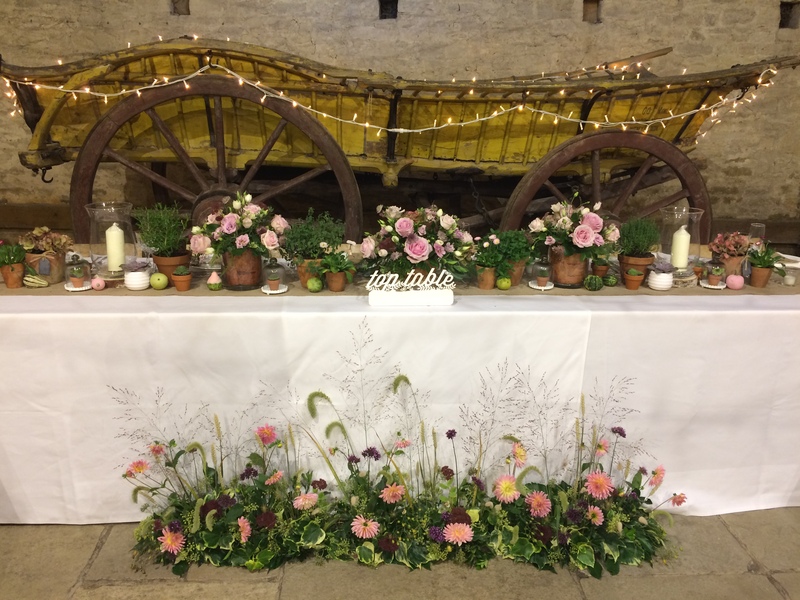 Stacey is their amazing onsite wedding planner and she is on hand to help you through every detail and aspect of your wedding day. 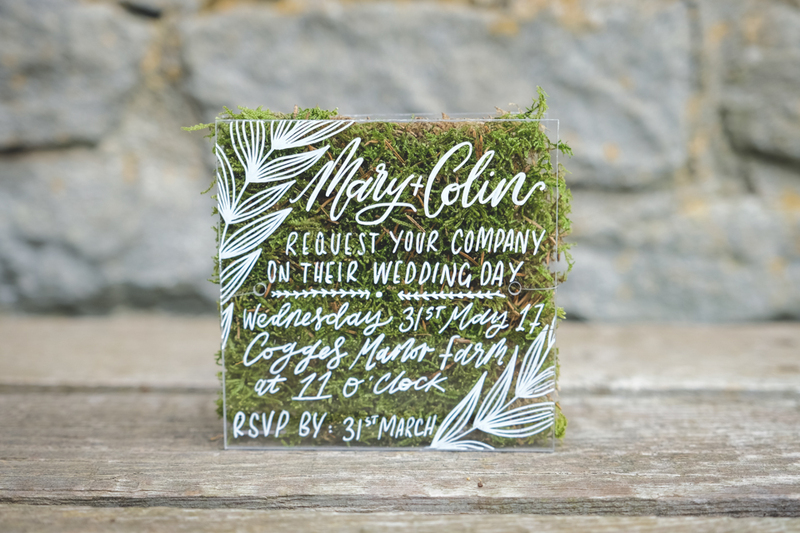 Not a cookie cutter style wedding in sight – just the personal touch all the way. 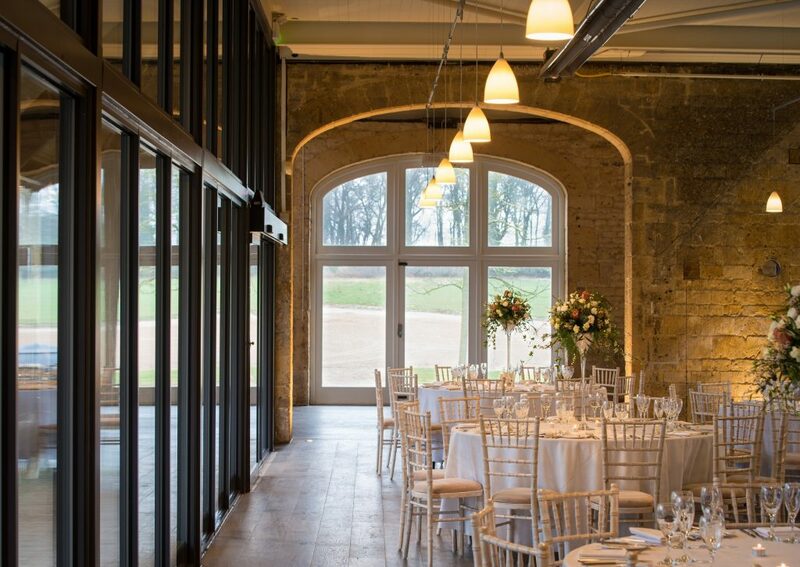 This is a beautiful hidden gem of a wedding venue in Oxford. From the outside you don’t know the expanse of options that are available inside. It provides a truly wonderful labyrinth of options to hold a wedding or special occasion. If I was getting married again, this is the wedding venue where I’d choose to say ‘I do’! 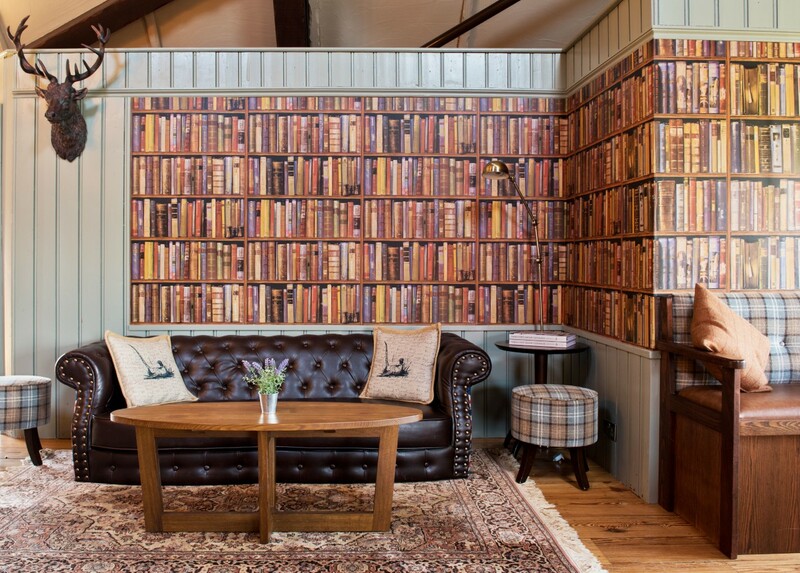 Its a brilliant compromise between a hotel and the blank canvas of a barn, which for me is the best of both worlds. Though slightly out of my normal radar, this wedding venue sits about 20 miles from Witney in the north of the Cotswolds. However it was well worth a visit to look around on such a glorious sunny day last month. 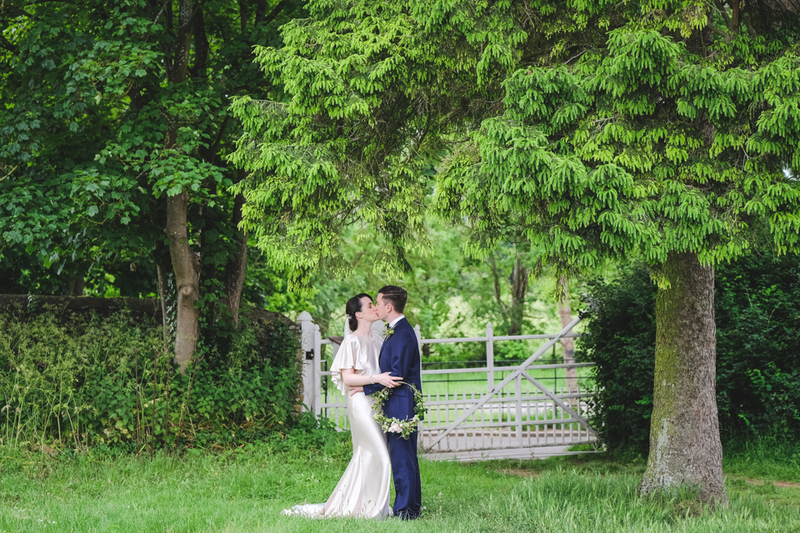 I feel really lucky to live in such a beautiful part of the country and it was wonderful to drive through such stunning countryside to get to this venue. Unfortunately, my drive was slightly longer than planned as I made the mistake of trying to find this venue from their postcode. It is much easier to find if you stick to the main roads, coming off the A44 towards Chipping Campden on the B4081. 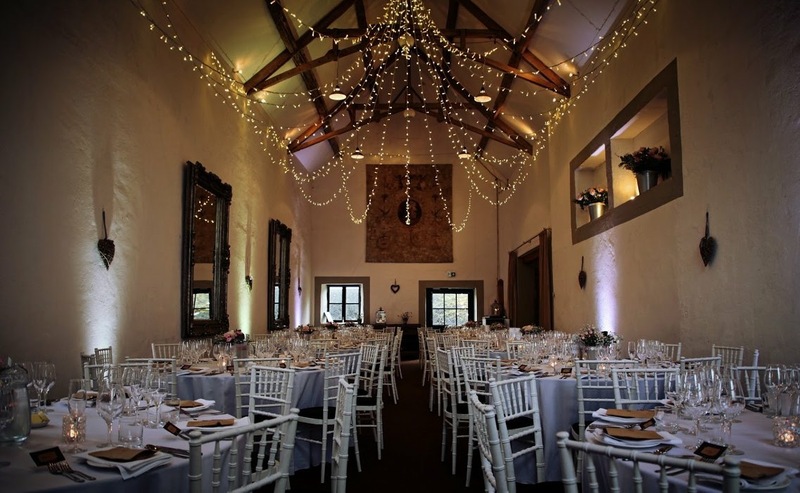 Or type ‘Lapstone Barn Wedding Venue’ in your Google maps! There’s a lovely sense of escapism when you arrive and this venue feels like it’s completely in the middle of nowhere. 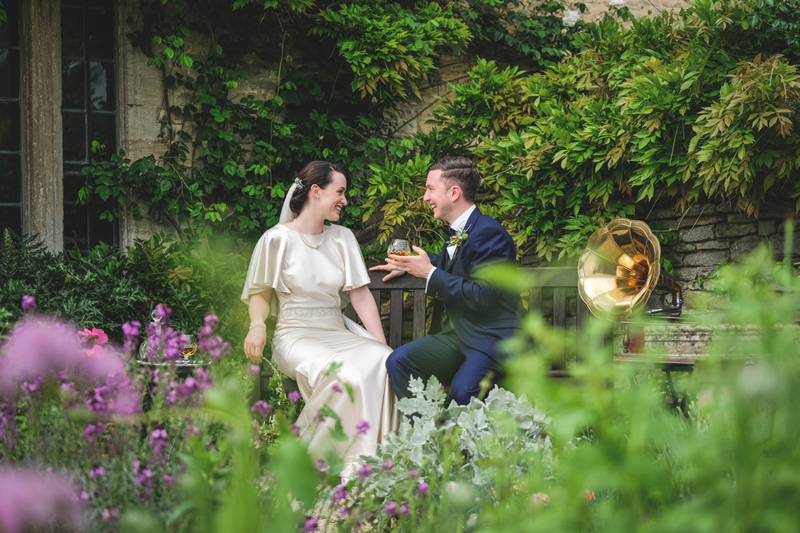 Found not far from Batsford Arboretum, Dormy House and a stone’s throw away from Snowshill, with the lavender of the region echoed at the venue. 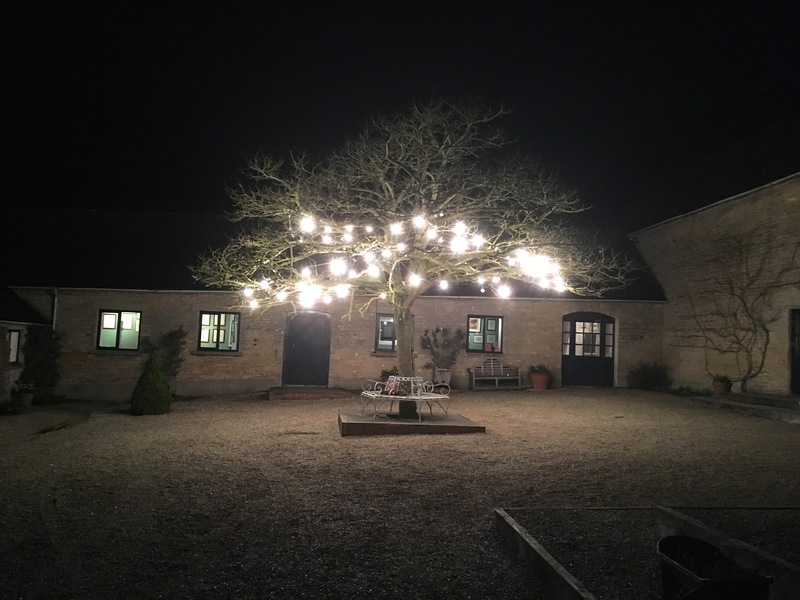 This 18th century stable farm (and then a furniture shop until only last year) has recently been beautifully and breathtakingly done up to a luxurious finish. 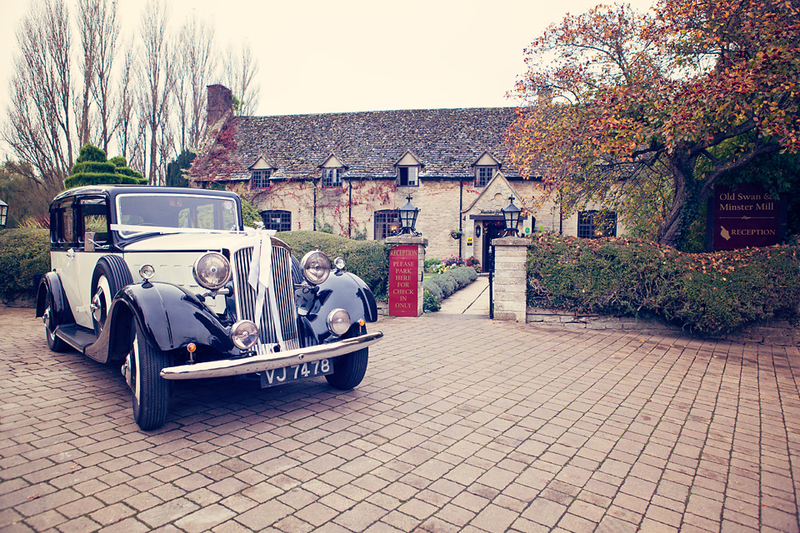 With all the class of a London venue alongside the tranquil and rural setting of the Cotswolds. Industrial chic at it’s best and you can’t beat the backdrop and amazing scenery that this venue has to offer. After coming down the long drive, there’s a spacious car park out the front of this newly refurnished barn. Whilst the outside space was still a work in progress when I visited, you can still see the potential and vision that will come to life as soon as the warmer weather appears. With plans for a water feature and lavender in their courtyard and new tree being planted outside. Every aspect is being considered to provide stunning memories for your big day. There are two main parts to the inside of the venue, both exude a modern, classy and warm vibe. 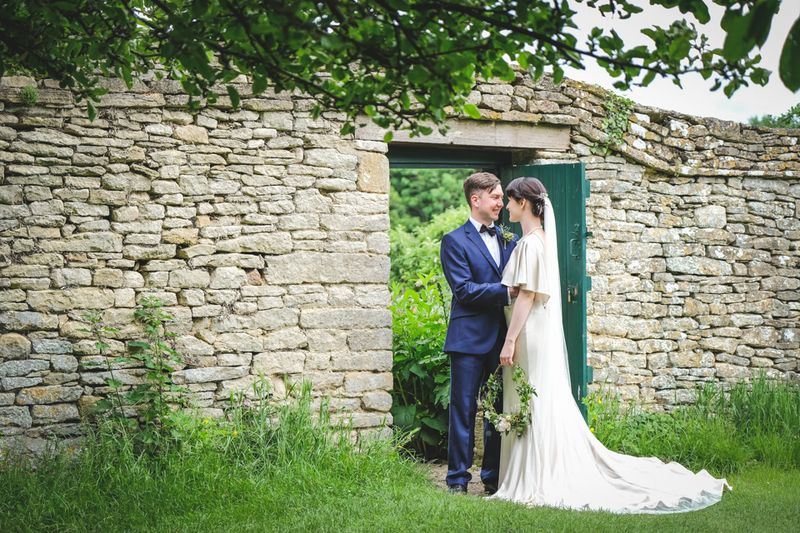 The Stone Barn is more rustic and what you’d come to expect of a Cotswold barn venue and typically where couples choose to have their ceremonies. 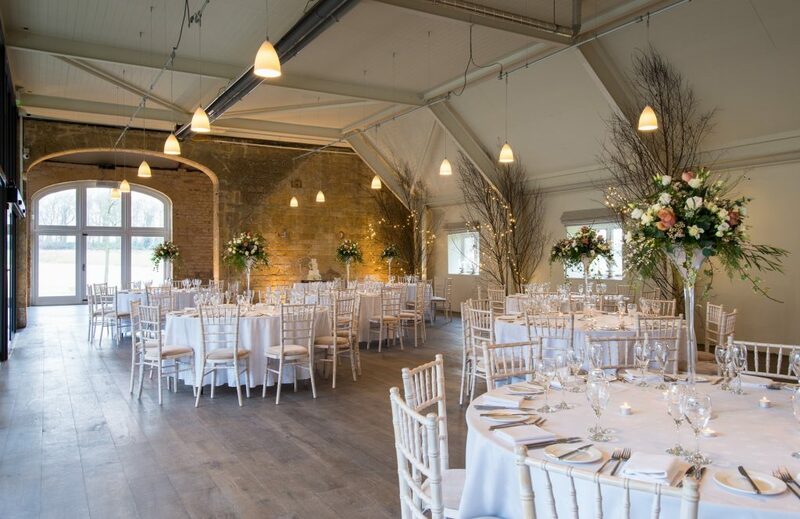 Then the Northwick Barn is a large industrial loft style extension where you could hold your wedding reception. 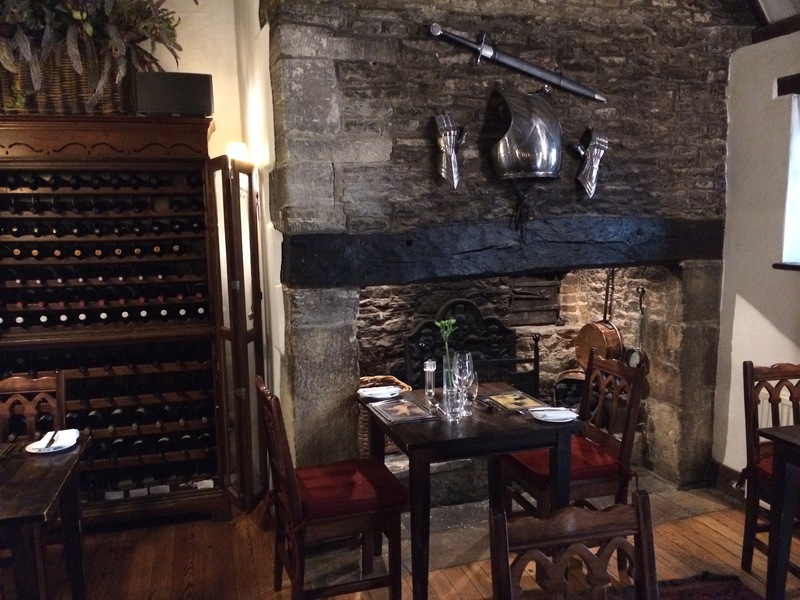 But the options could also include the courtyard (which is also licensed). 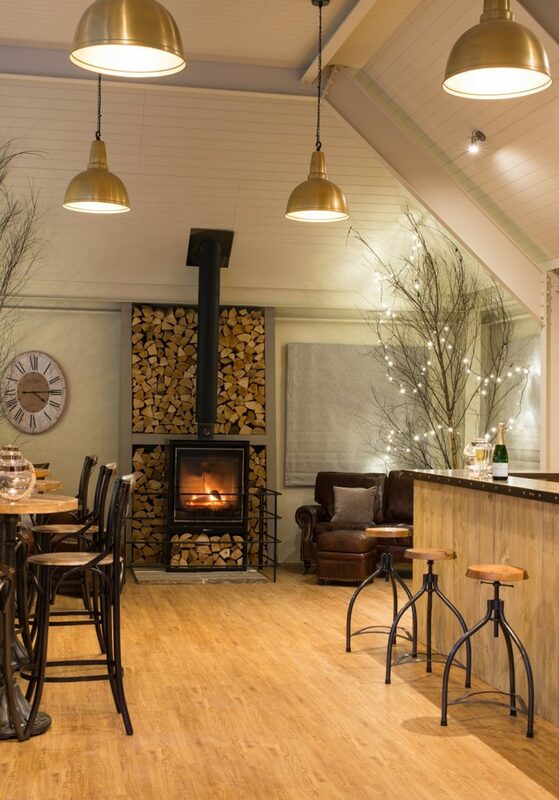 Then there’s a further Tanner bar section with seating and a wood burning stove – hygge typified! 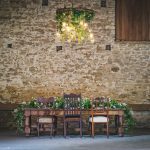 What struck me was that the venue seemed really light – both natural and artificial – with great expansive windows and doors, plus I loved the really modern light fittings. On top of this, there are lots of places and separate areas to sit inside and outside, which would be great for people to break away during the reception or when music is playing. 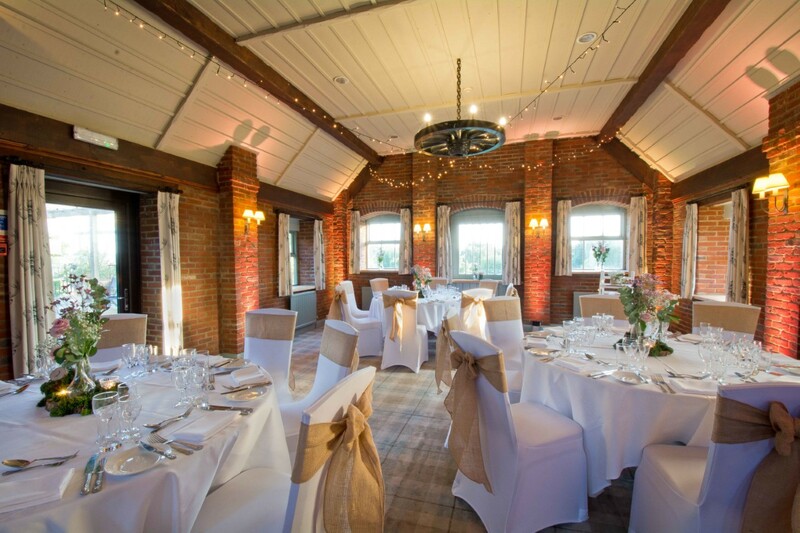 Lapstone Barn offers all inclusive catering and bar packages and you can have the venue exclusively from 10am – 1am. 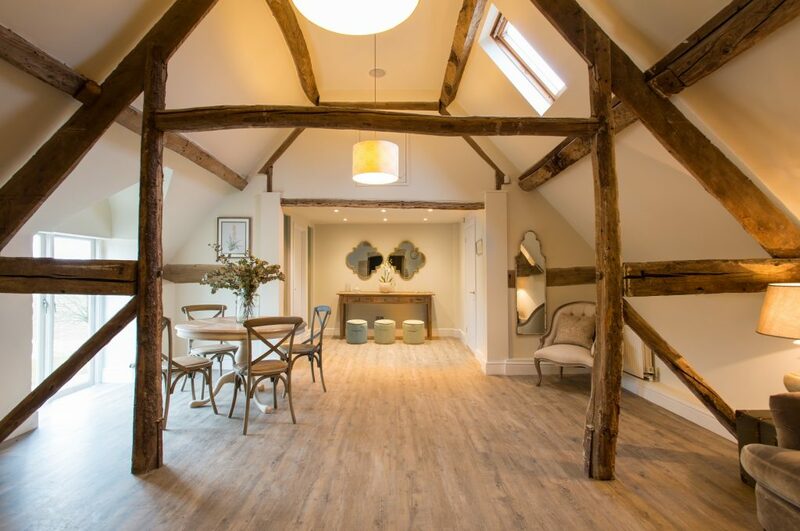 There’s also a great area to get ready upstairs in the Hayloft where you can see your guests arriving along the drive. 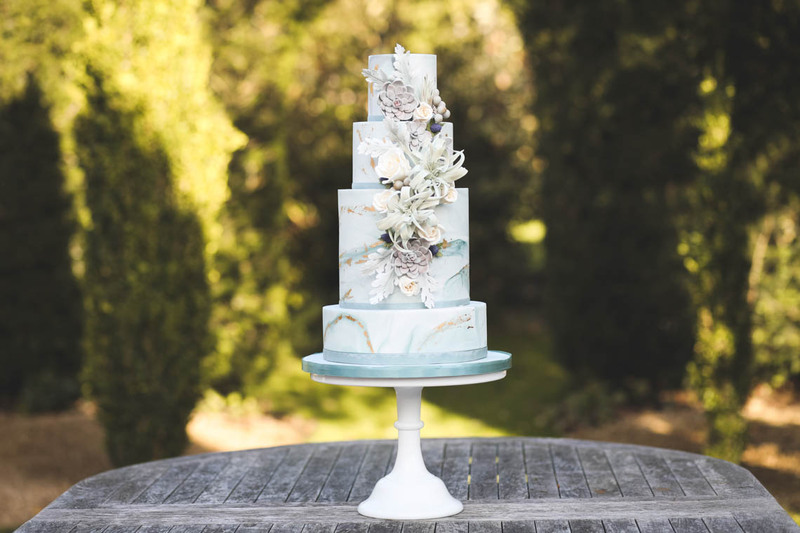 These new kids on the block are certainly not wet behind the ears, as they boast years of experience and an extensive list of suppliers in the wedding industry. 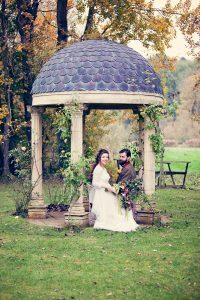 They have worked on high-end bespoke marquee weddings and are bursting with ideas and expertise in creating stunning weddings. They’ve got great vision and a brilliant eye for detail. They’ll even set the tables for you! So all you’re left to worry about is the decor, entertainment and getting yourself ready. 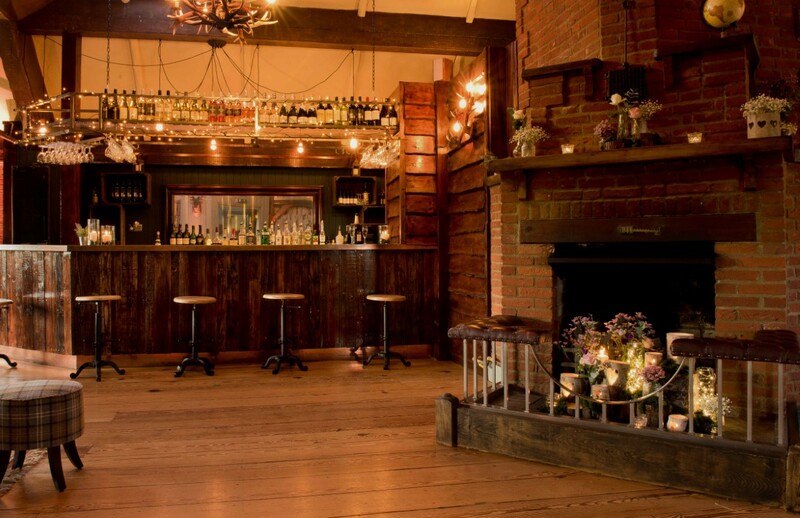 This wedding venue is a beautiful halfway house between a barn and a hotel. 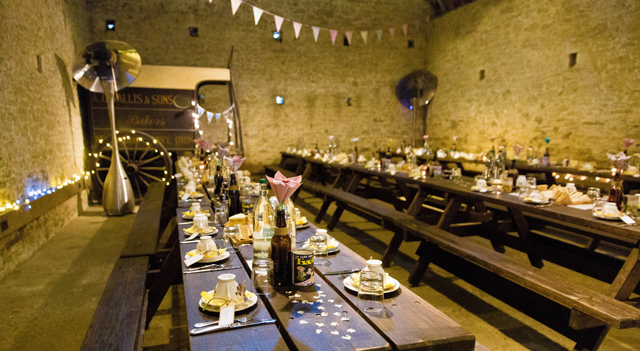 With the facilities of catering and a bar like a hotel, along with the charm and personalisation options of a barn. Well, if you’re looking for the WOW factor, turning in to the long drive way and getting a first glimpse at this wedding venue will get your jaw dropping and have your guests in awe. 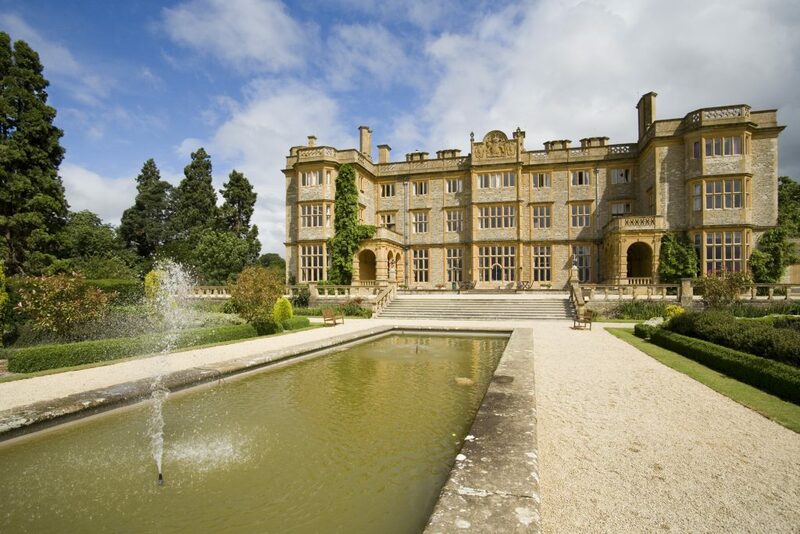 Set in rural Oxfordshire lies Eynsham Hall which, despite it’s name, is actually in North Leigh (on the road between Witney and Woodstock) rather than in Eynsham itself. After driving through wooded areas, you come upon some impressive gates that lead the way to the estate. The half-a-mile, tree-lined, driveway escorts you until the Hall slowly comes in to view. Eynsham Hall pitches itself as a stately (but not stuffy) Jacobean manor. And this harmony of traditional and contemporary elements sit alongside each other seamlessly. 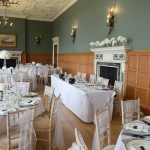 I was delighted to look around this wedding venue at Christmas time and loved all the festive trees decorated individually in each room. And it’s the quirky attention to detail that pops up in every room making each one a bit different with their own talking points. 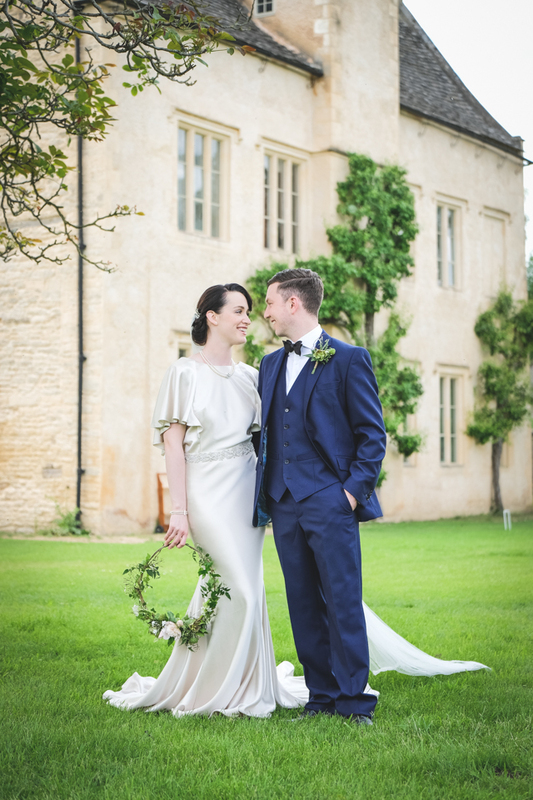 Not only a grand stately home, but Eynsham Hall is surrounding by around 3,000 acres of beautiful parklands and formal gardens – perfect for your wedding photographs. The terrace overlooks a fountain with a relaxing sound of the slow trickle of water. There’s also tennis courts, a pool, sauna and beauty treatments on site to enjoy before or after the big day. There is certainly no doubt that this is a stately home – proud of its heritage and exuding opulence from it’s very essence. 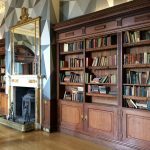 With an amazing staircase to make a grand wedding entrance, oak panelled walls, foreboding portraits hanging, huge fireplaces and large arched windows with big window seats to perch and view the impressive gardens. But this venue also oozes charm and elegance. It is relaxed and accessible just like the mismatched sofas and arms chairs in the lounge that invite you to sink in to them. 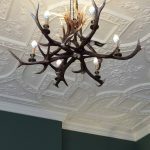 And my eye kept being drawn up to the striking high ceilings to notice that each room had a slightly different modern twist for the chandeliers, whether that was using drinking glasses, stag antlers or even a spider’s web. 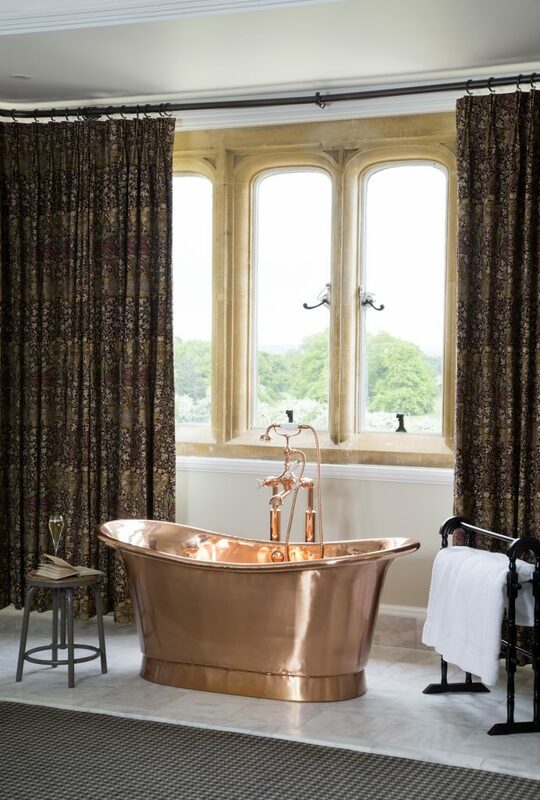 It also boasts a luxurious bridal suite including a big copper bath to enjoy. Plus the spacious Peacock Room for the bridal party to change and get ready in before the ceremony. For your wedding day, this would be your house and you’d feel at home and be made very welcome. This wedding venue only hosts one wedding a day so you have their exclusive and undivided attention. 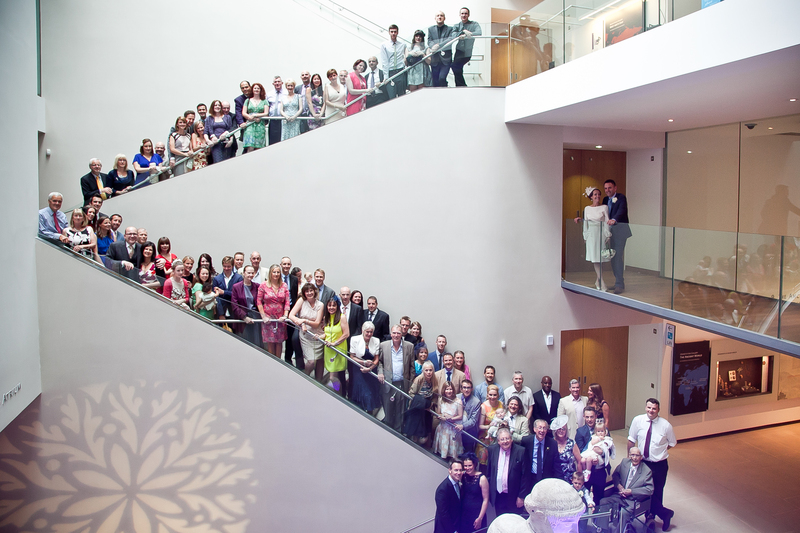 The staff are slick behind the scenes and experienced at what makes a wedding work well. 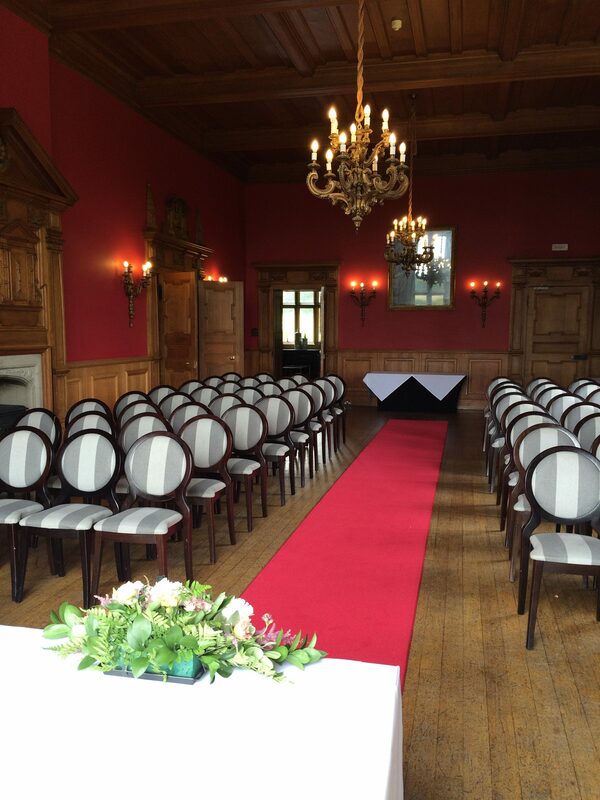 There’s options of which room to hold your ceremony (as well as whether you have it inside or outside). 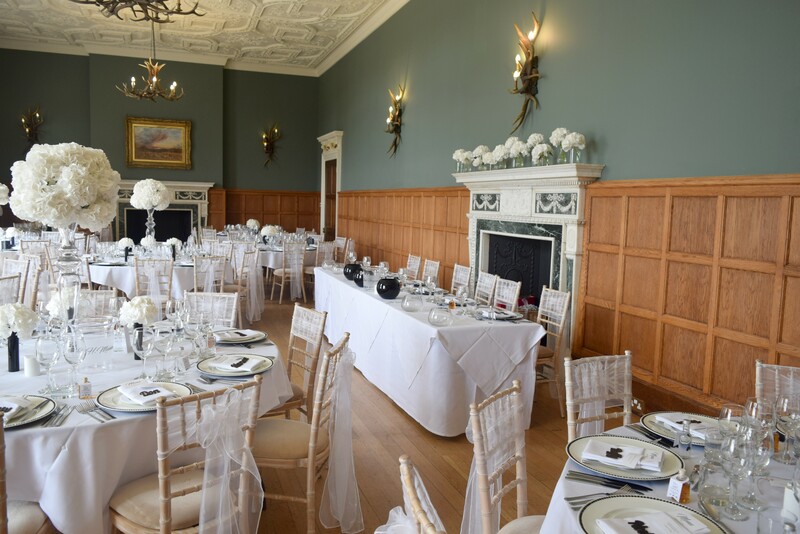 Whilst Eynsham Hall has always specialised in large scale celebrations, it has also announced the addition of a new and intimate licensed ceremony space for weddings for 40 guests from January 2018. You’ll be spoilt for choice with the number of different rooms at your disposable. 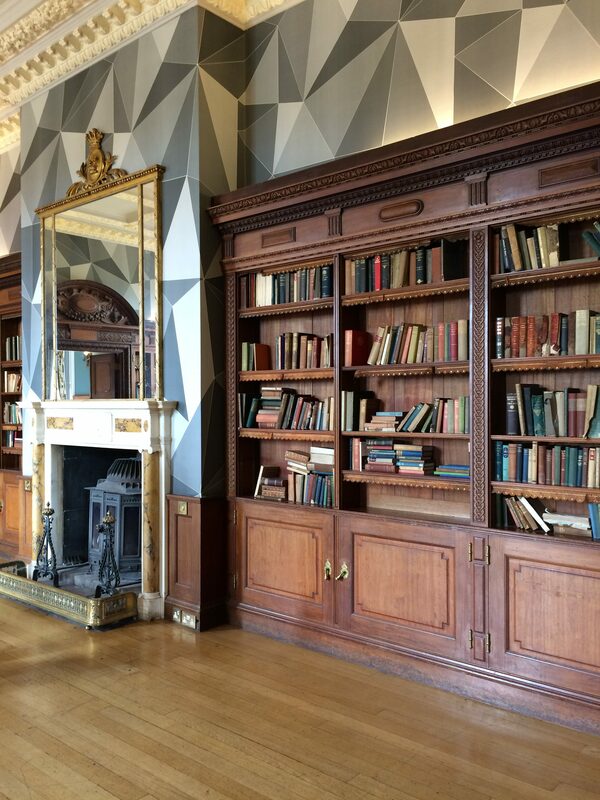 You could use one room for the ceremony, the library for drinks, relax outside on the terrace and have a sit down meal in another room. 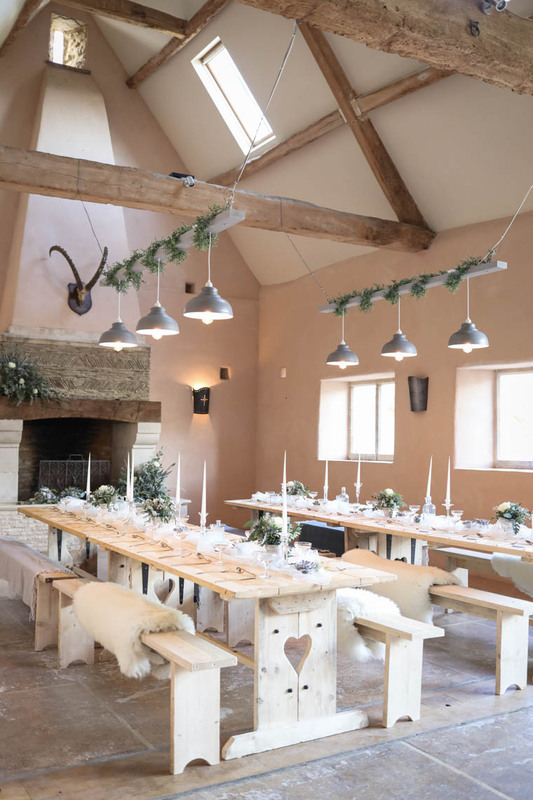 In my opinion this venue wouldn’t suit the diy couple who want to personalise everything, as the decor and surroundings already speak for themselves. There’s not much that you’d need to organise yourself. 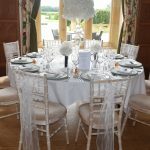 Although I think some chair covers may be needed in some rooms if the distinctive colour of the chairs doesn’t suit your own wedding theme. 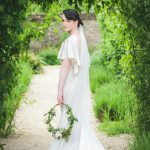 This wedding venue needs no adaptation or adornment and will provide you with a lush backdrop to a stunning wedding, whether you’re after an impressive, plush do or an intimate affair. We live in such a stunning part of the country, commonly regarded as an area of outstanding natural beauty. The Cotswolds is located in south central England and made up of 6 counties: Gloucestershire, Oxfordshire, Somerset, Warwickshire, Wiltshire and Worcestershire. It’s no wonder that every year 20,000+* of couples getting married in England choose to say ‘I do’ in a wedding venue in the Cotwolds. Mainly rural landscape, with it’s lush green countryside, the Cotswolds is a relaxing escape from the big cities. With acres of lavender fields, historical towns, stately homes and picturesque, chocolate box villages with their honey coloured limestone buildings. It’s no surprise that this region has many places that feature in the Britain’s richest towns list. And we are perfectly located amongst the ‘golden triangle’ of the Cotswold towns of Burford, Chipping Norton and Woodstock. 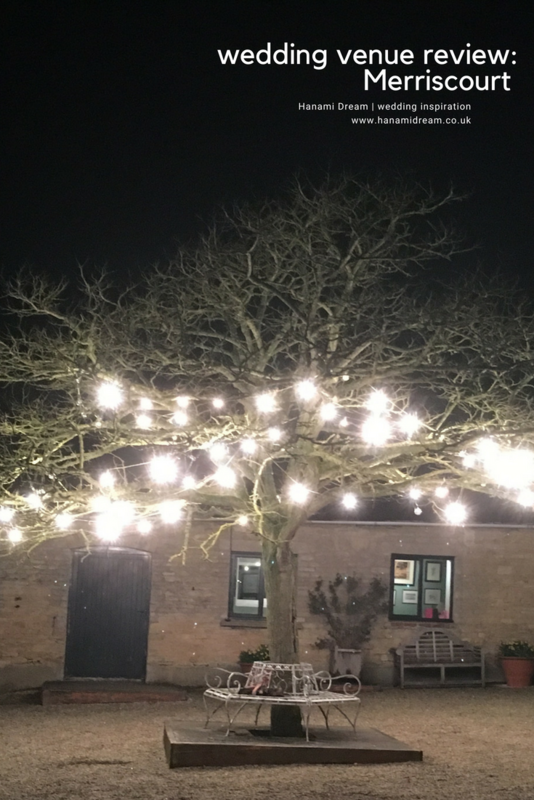 Hanami Dream is based in West Oxfordshire and there are some truly beautiful venues to choose from in the surrounding Cotswolds. 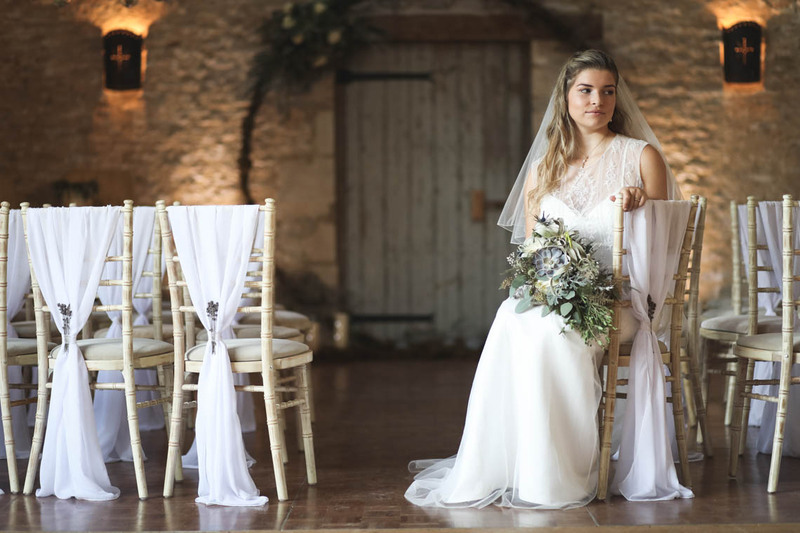 Whether in a barn, a manor house, a marquee or a hotel, there are some amazing places (with some breathtaking views) to hold your wedding or special occasion. There’s something out there to accommodate most styles, guest numbers and budgets. 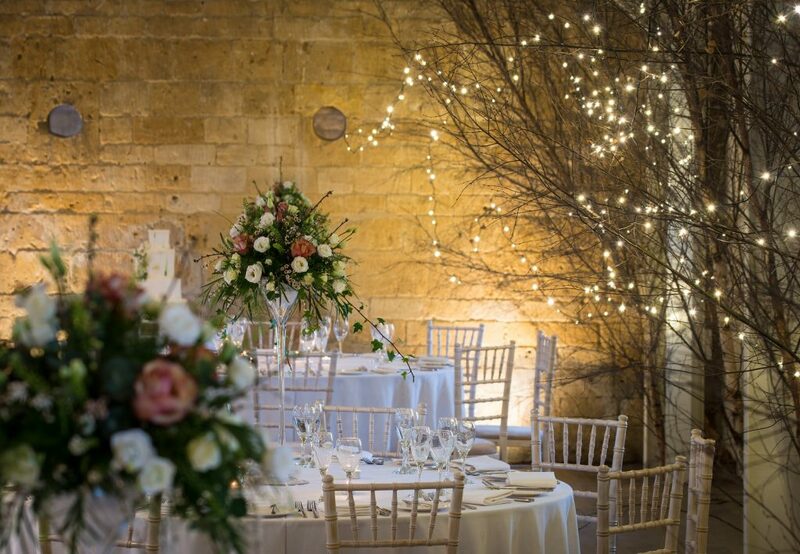 We are certainly spoilt for choice around here for amazing venues to hold a special occasion. 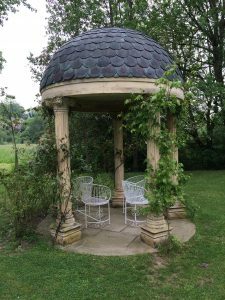 For more details on how to pick your perfect wedding venue look out for my The Holy Trinity of Wedding Planning – Part 2: where. *Data from Office of National Statistics www.ons.gov.uk Area of occurrence 2015. Based on 245,513 marriages in England. Based on 20,106 marriages in the Cotswolds (combined Oxfordshire, Gloucestershire, Somerset, Warwickshire, Wiltshire and Worcestershire). 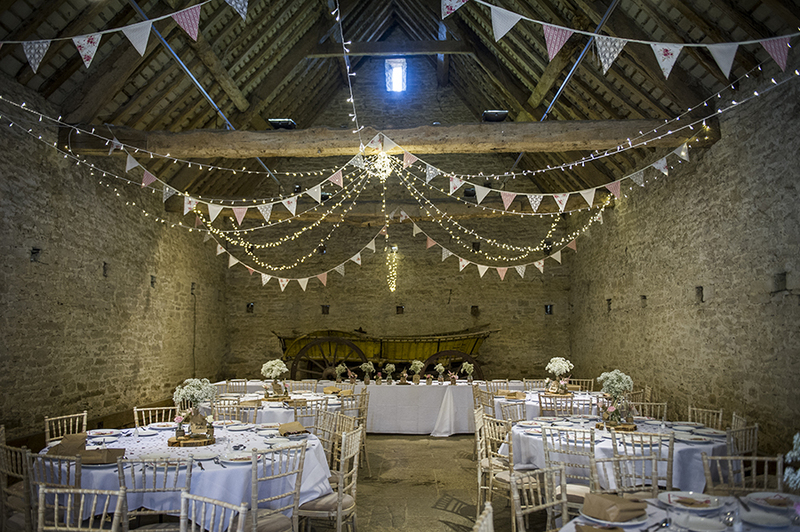 Not too far off the A361 (which runs from Burford to Swindon) is a beautiful wedding barn. You’d be forgiven to thinking you were in the middle of nowhere as this wedding venue location feels so remote. There’s a wonderful quietness to the surroundings and a lovely sense of still and calmness. 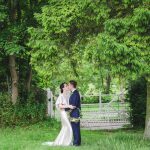 It really is an escape from the busy city and a chance to be immersed in the countryside to celebrate your special day in style. 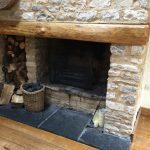 Oxleaze Barn is a tucked-away Gloucestershire barn with year-round warmth, thanks to its solar panel and biomass generated underfloor heating. 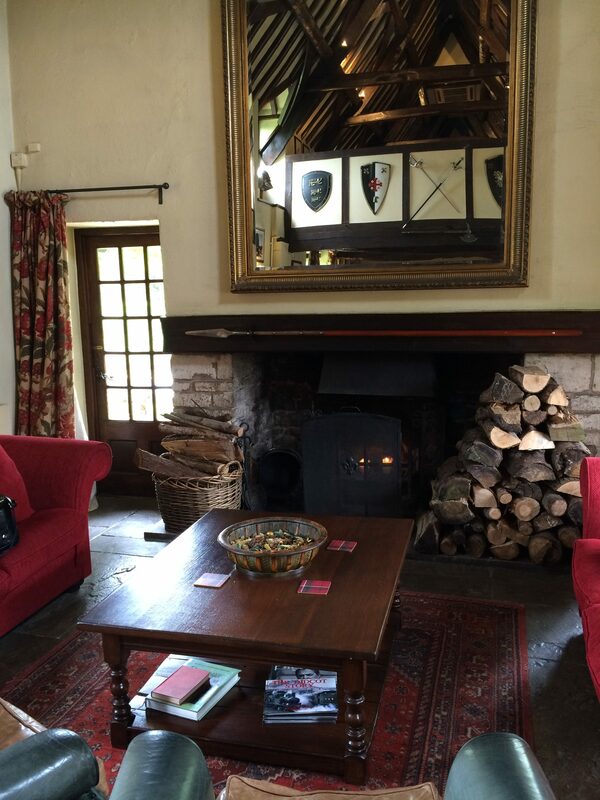 Built in 1702 and beautifully renovated with some stunning original features, yet adapted efficiently to provide a comfortable space and offer weddings whatever the season. 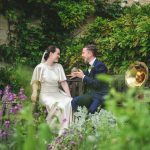 Tucked away in rolling Cotswold countryside, on a working farm, this wedding venue has ample parking, space for catering vans, a landscaped courtyard and firepit, along with access to a phenomenal private garden for your photographs. 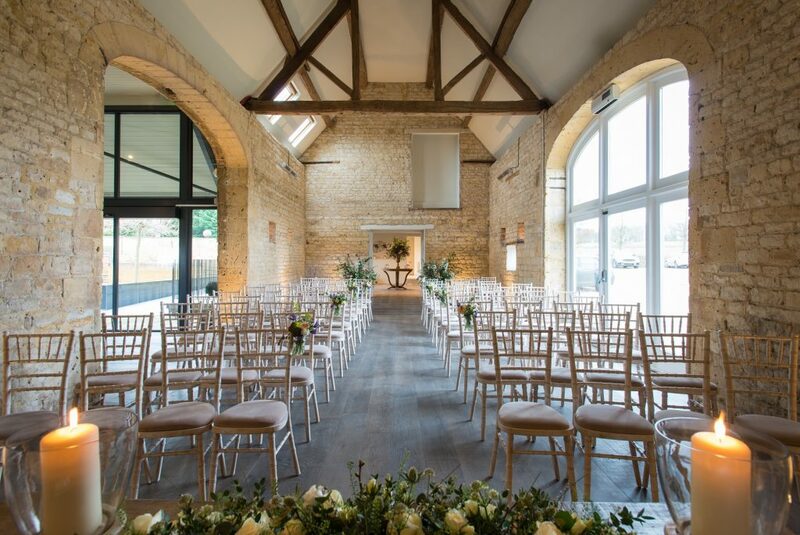 It’s also well equipped, with a spacious Artist’s Studio to get ready, a state of the art commercial kitchen and luxurious toilet area, plus Chiavari chairs if you want them for your wedding set up. 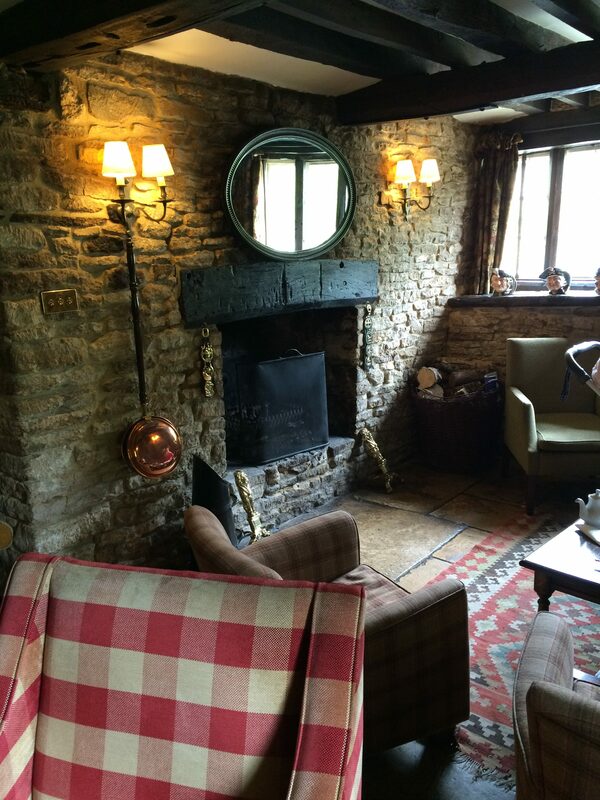 Cotswold Event Solutions are on hand for any other furniture requests and The Watering Hole manage the bar for them. 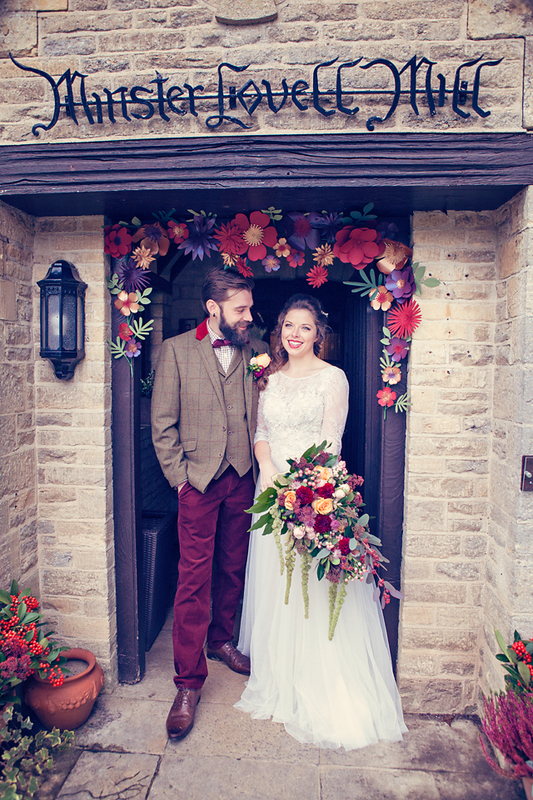 There’s only one wedding a weekend so you’ll have the time to decorate and enjoy your day without feeling rushed. With 4 years experience under their belts, this family run business have got the right mix of flexibility along with advice if/when couples require guidance. 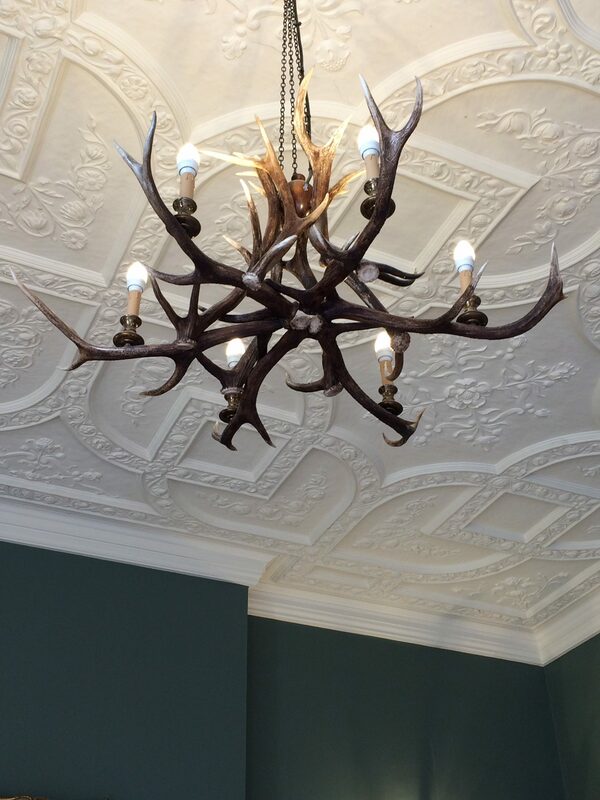 They offer a relaxed and friendly service partnered with a wonderful space that they are continuing to improve and evolve. This year their offering will include the expansion of additional barn space (The Milling Barn) which will give an extra area for the drinks reception and disco. 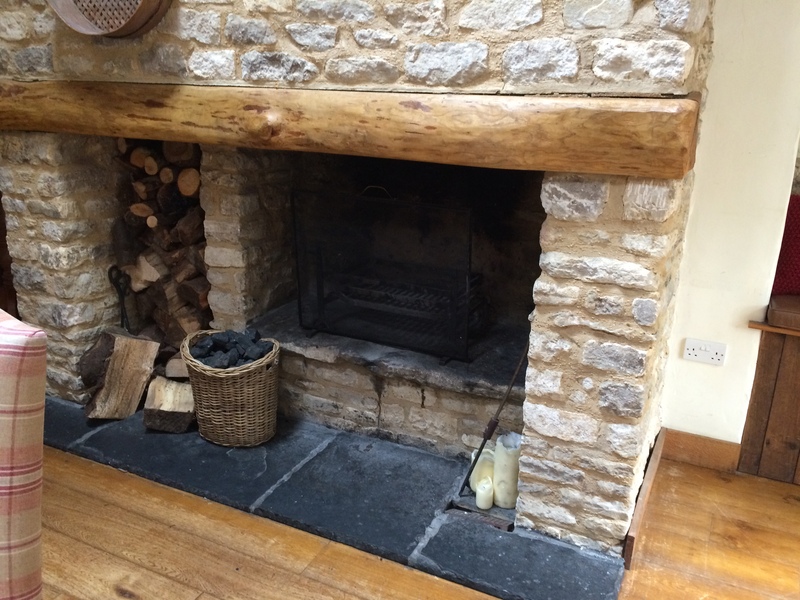 In addition, they are converting a 3 double bedroom cottage for accommodation later this year. 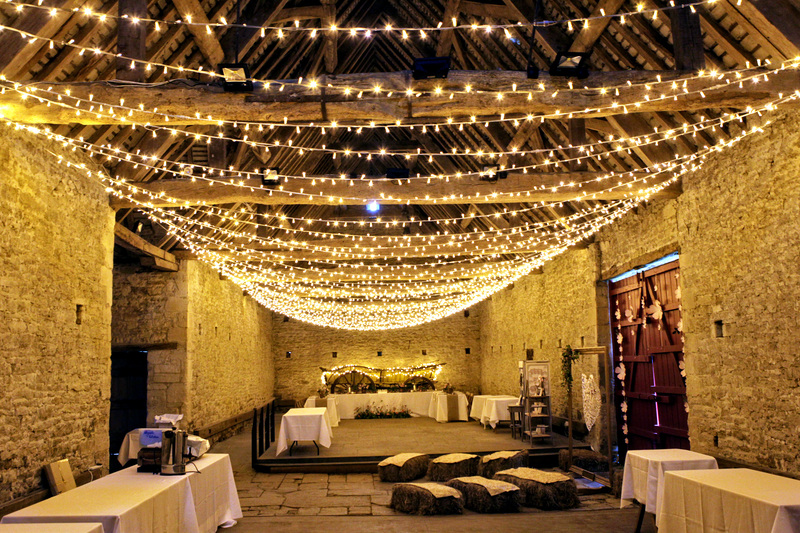 Oxleaze Barn is certainly an up and coming venue to watch out for. Plus it seems that it is one that is responding to couples’ requirements and developing their offering. 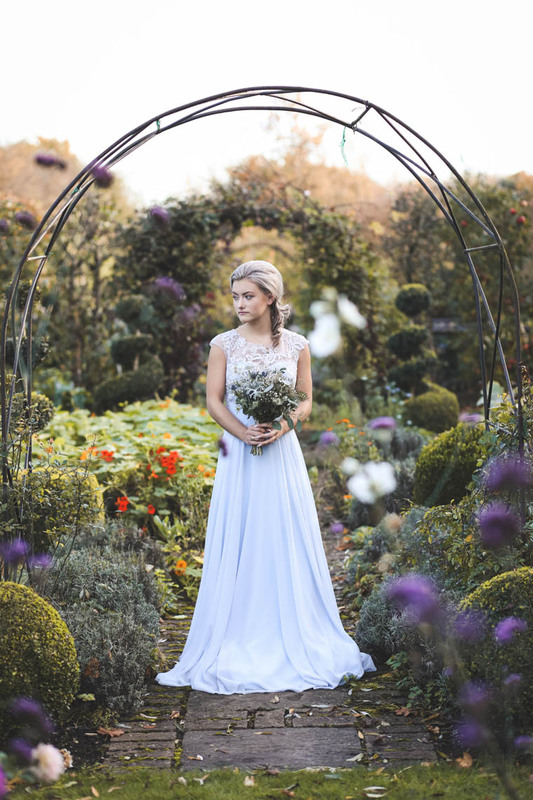 And see how this beautiful venue looks in my Journey to the Centre of the Earth inspirational styled bridal shoot. 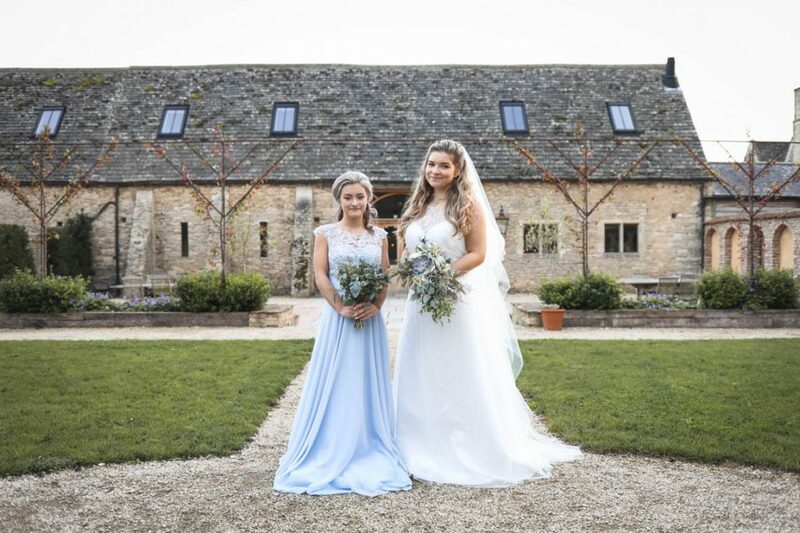 Cogges Manor Farm is nestled in the lovely market town of Witney and offers two stunning seventeenth century barns which provide a wonderful setting for celebrations. 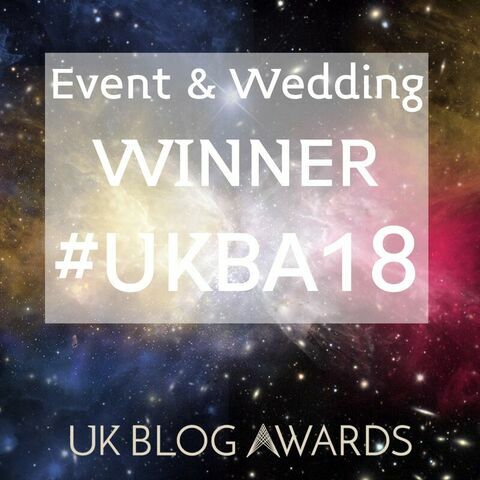 I may be a little bias, as this venue has a special place in my heart – not only is it a beautiful local licensed wedding venue in my home town, but it is also a haven and wonderful place to escape with the children. 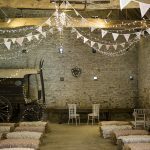 More than just a farm museum and set location for Downton Abbey, it also offers two rustic and untouched barns as a wedding venue. 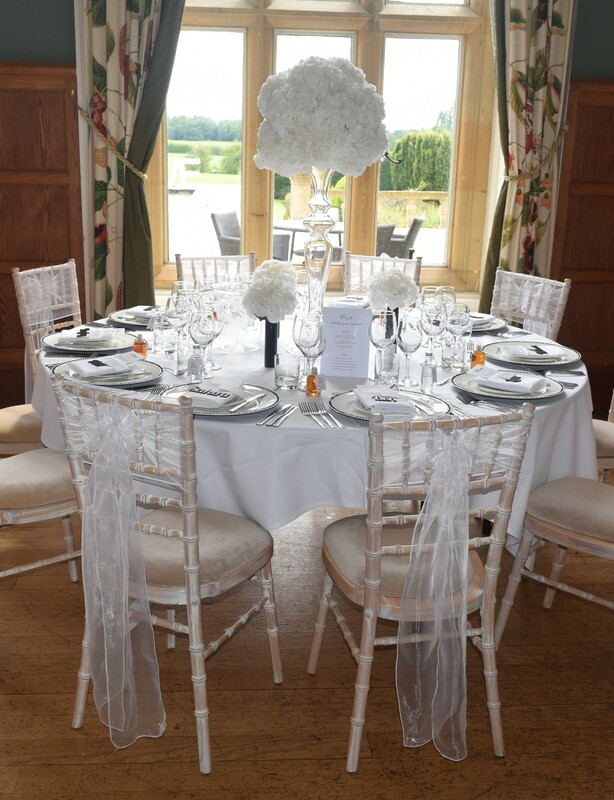 They are a perfect blank canvas where you can add your own personalised details to make your special day complete. 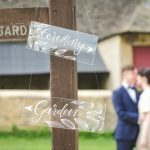 More and more couples are shying away from the cookie cutter approach to weddings and demanding a more unique and individual wedding. This venue certainly helps couples who want to fulfil this ‘diy’ desire as there are hardly any restrictions or prescriptions. 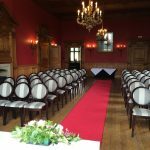 You have the freedom to use the suppliers of your choice, you can choose your own room layout and your own decoration to suit your theme for the day. Therefore, you have the option of taking this venue in a variety of different directions. It’s a really versatile space. 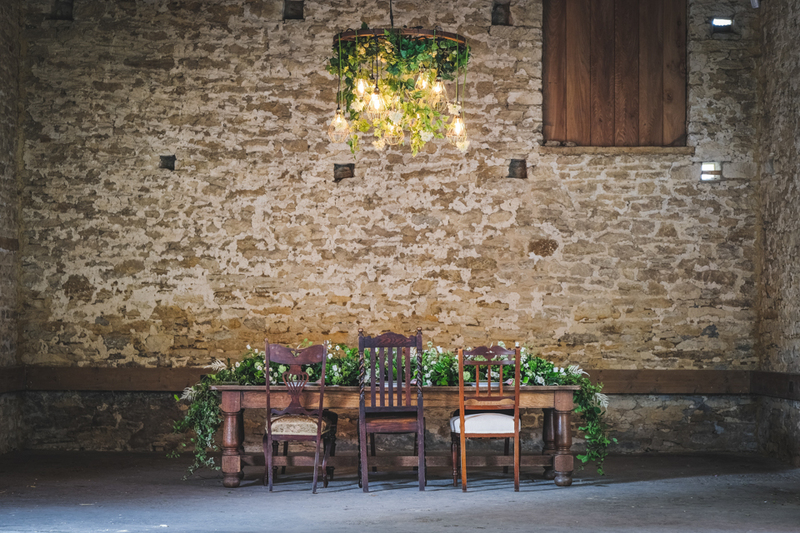 Don’t be under any illusions – it may take a little extra work than a ready made venue but you can make this place fit your theme perfectly. 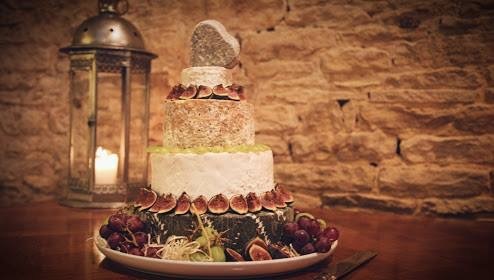 And embrace the fact that it’s rustic – you’ll need to think about your catering options cleverly. For example it would lend itself very nicely for a hog roast, bbq, picnic or food vans. It feels like the location is really rural but you’re actually right by the centre of town. And this is more than a shell of a building in the middle of a field – there are facilities (although you’ll need to bear in mind it is still rustic and a short walk to the toilets), accessible and ample parking, plus it’s close to bus routes and hotels. What you do get is a lot of space (both inside and outside of the barns). 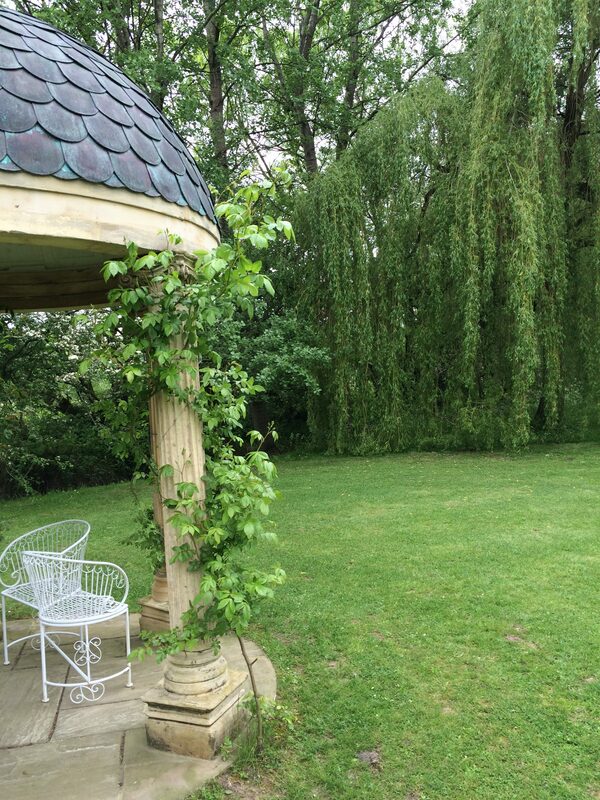 And the beauty of Cogges is that it is more than just a wedding venue. Your guests can benefit from all the other facilities and attractions around the site in between the formalities of the day. And after 5pm, as well as the barns, the rest of the site is exclusively yours to enjoy too. There’s a lovely laid back and friendly atmosphere at Cogges Manor Farm and loads of charming locations for photographs, such as the Manor House lawn, the walled garden or orchard and you can even include the farm animals in your photos! They have a limited number of wedding slots per year and there is only one wedding per weekend. 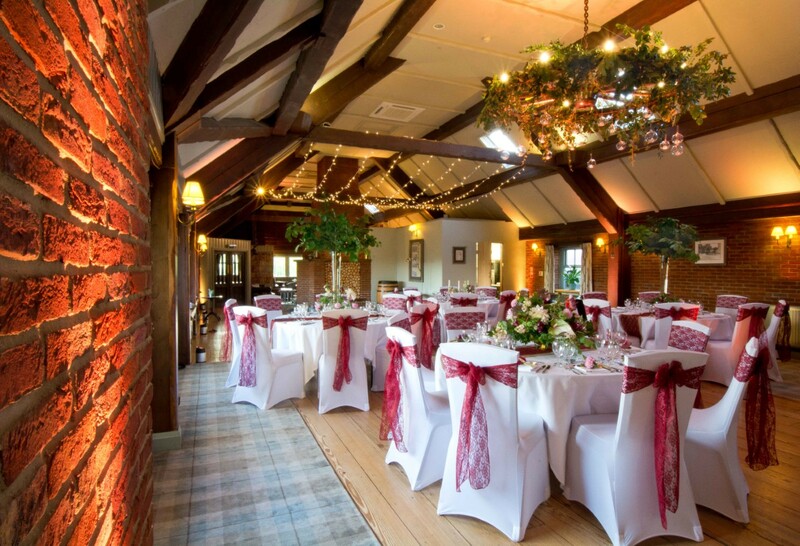 I will be styling the venue for their Wedding Open Day on Sunday 17th September 11am-3pm. 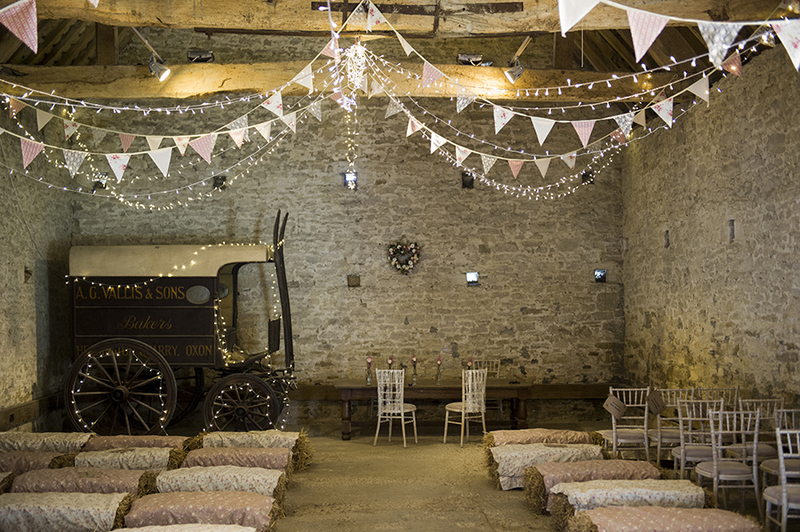 Come and see the barns dressed for wedding planning inspiration. 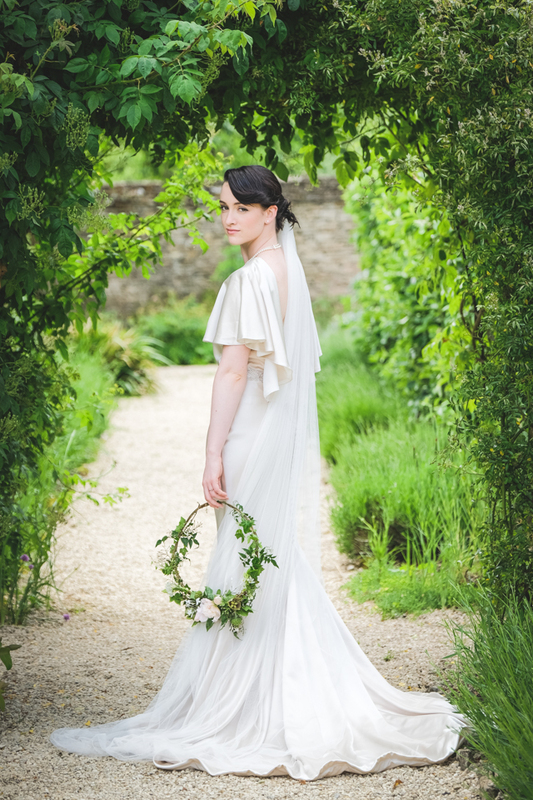 And see how stunning this venue looks in my Modern Edwardian Secret Garden inspirational styled bridal shoot. This place definitely has curb appeal. 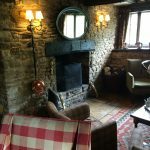 From first impressions you’d be forgiven in thinking it is a quaint looking pub set in an idyllic and remote Oxfordshire village. 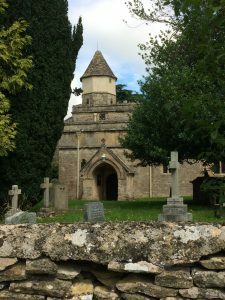 The traditional Cotswold stone buildings don’t disappoint but make sure you don’t judge a book solely by its cover, as this place is like a tardis and is expansive behind that initial beautiful façade. What sprawls behind is a maze of wonder and great possibilities. 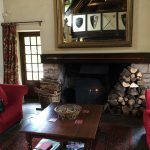 A 5 star country inn set on the River Windrush surrounded by 65 acres of Cotswold wildflower meadows and riverside gardens. This is a destination to get away from the hectic, crowded city to a stunning and tranquil setting. The river meanders effortlessly through the extensive grounds passing peaceful locations to trek to and discover: a disused boat house, bridges, tree swings and deckchairs along the riverbank. 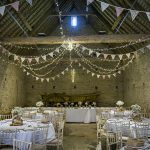 With fields to hold a festival style wedding , space to put up a marquee and a renovated barn for your evening reception. You’d not be surprised to find Mole or Ratty scurrying along as the setting conjures up scenes from the Wind in the Willows with ease. You could relax in a riverside room with an outdoor fire pit on a private terrace. Plus there’s plenty of nooks and crannies for people to explore and retreat. 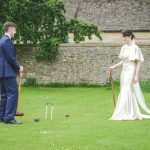 There’s an abundance of ways to enjoy the surroundings including rods to fish, tennis courts, a croquet lawn and even quirky duck races between bridges that people often incorporate in to their wedding day here. And some couples have sentimentally planted trees or roses in the grounds to mark their big day. The river culminates alongside the beautiful Temple Garden, one of many places you can choose to hold your wedding ceremony. 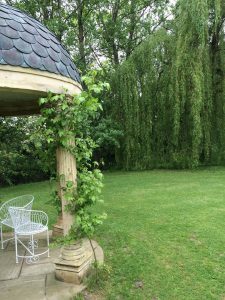 Complete with love seats and an amazing backdrop of a splendid willow tree draping it’s branches in to the river, flowing on it’s way to join the River Thames. 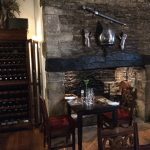 Inside doesn’t disappoint either with it’s grand, original Cotswold stone fireplaces dark wood, rich red upholstery and warm open fireplaces. But this place isn’t stuck in the past, it is bang up to date with it’s eco outlook on recycling and even has it’s own turbo screw to power part of the venue. It also has a brand spanking new spa where you and your guests can unwind and get pampered. 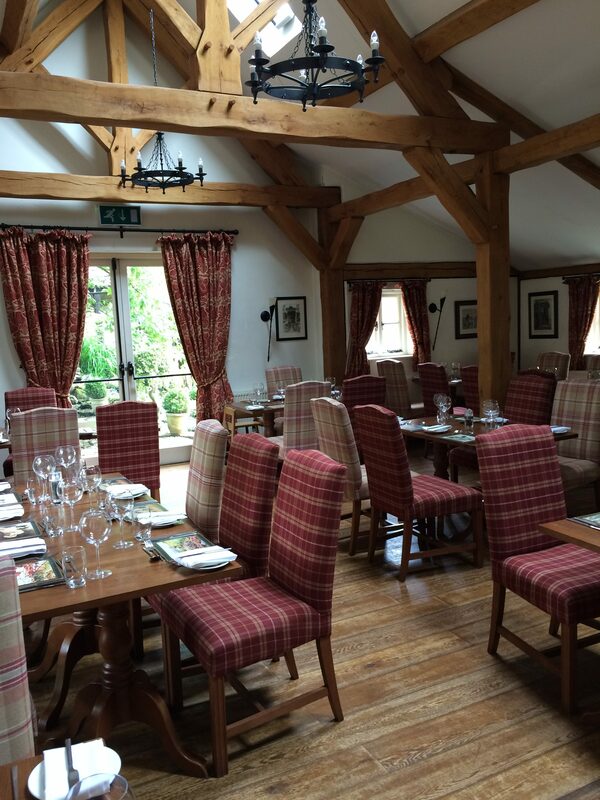 Plus there’s superb fresh local food and outstanding service. Which makes this a brilliant place to get married as it can be all encompassing – you can stay all weekend with your guests if you like! 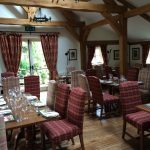 It won’t appeal to all budgets nor all sizes of guest lists as this is an intimate wedding venue where you’ll be spoilt and can celebrate in style and luxury. It’s versatile, tranquil, peaceful, relaxing, and so personal. 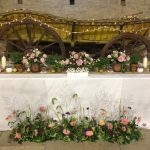 There’s lots of options and locations within this venue to consider: restored barn, outside temple, marquee in magical gardens, inside historic reception rooms. It’s no wonder you’d want to stay the whole weekend to make sure you have time to enjoy the whole site! 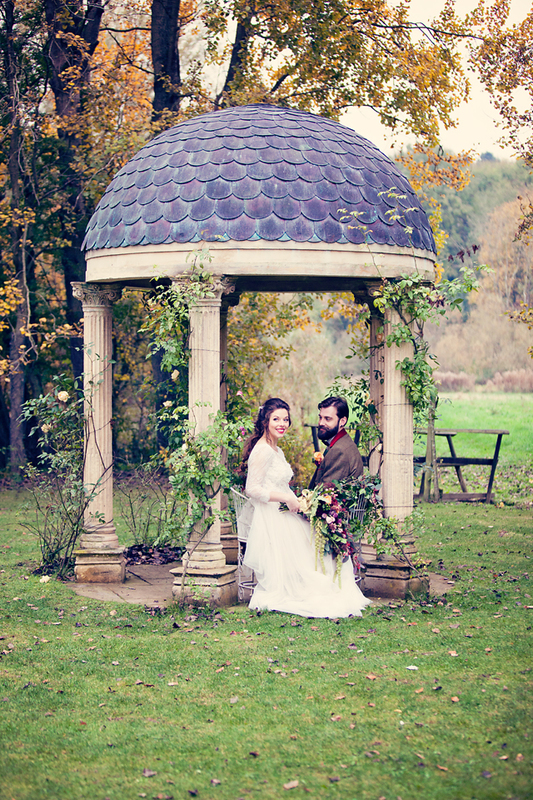 See how stunning this venue looks in my Wind in the Willows inspirational styled bridal shoot.